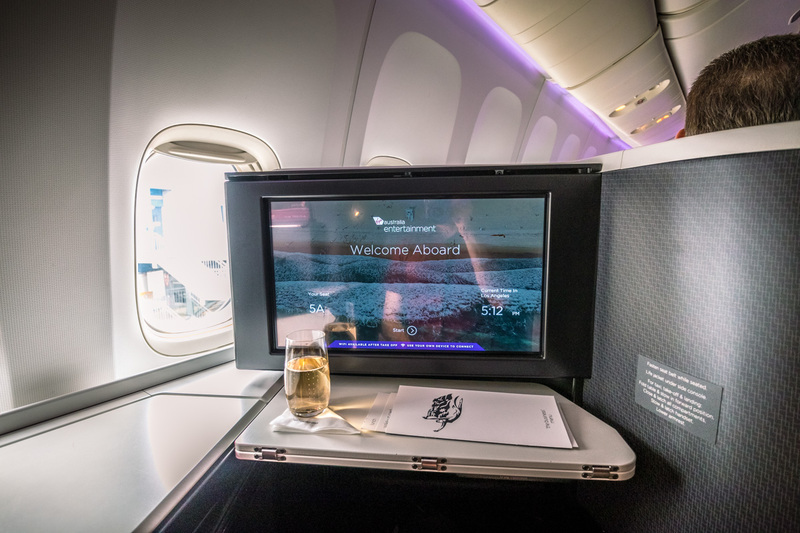 I head to the U.S. from Sydney at least once a year for a work conference, so having experienced Virgin Australia’s 777 “the business” previously (and enjoyed it! 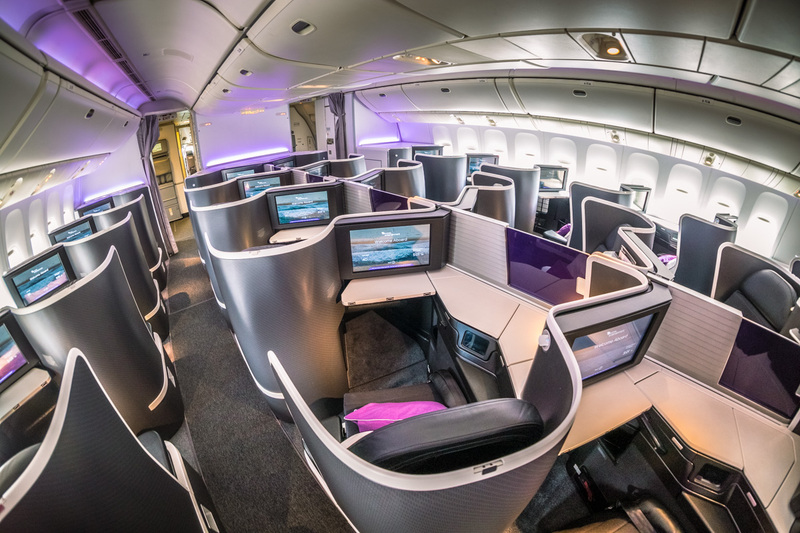 ), it was an easy decision to choose Virgin Australia again for my flight to Los Angeles in 2018. 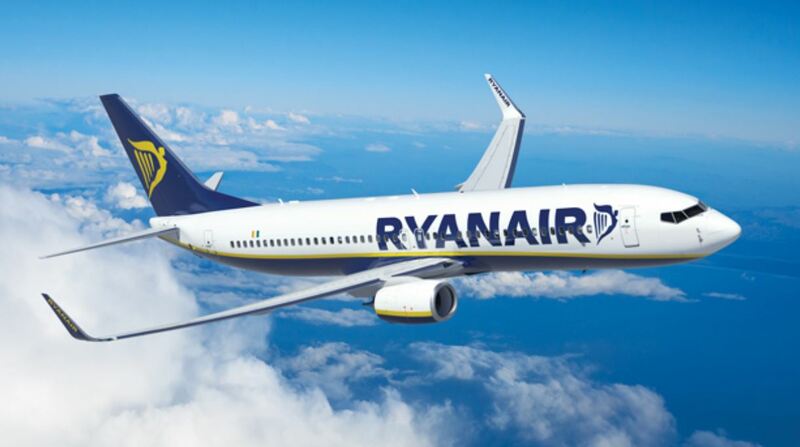 With limited aircraft and routes, the only way to find award seats on this product is usually either as the schedule unlocks 330 days in advance (I’ve had more luck around 325 days out), or a few days before departure. Having missed this window and needing certainty around this work trip, I booked a paid fare. 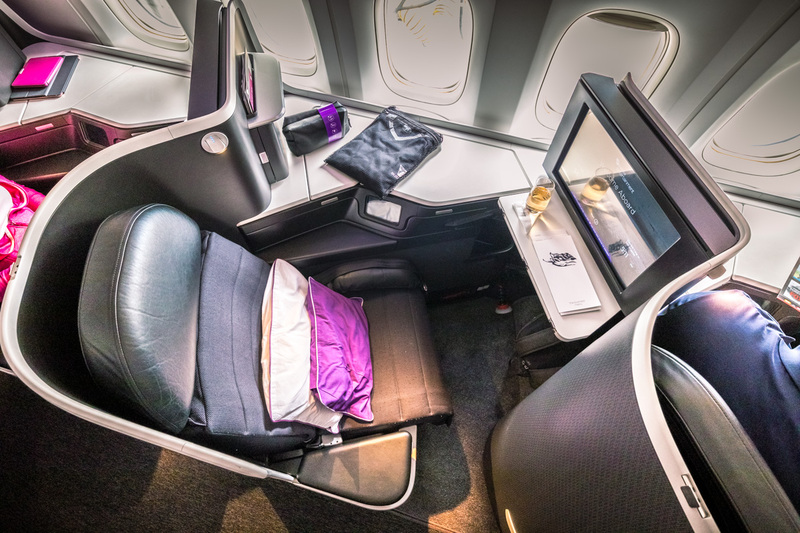 Thankfully, in April there was a sale for 20% off Business Class Saver fares exclusively for American Express Virgin-branded Platinum cardholders. I jumped on this and opted for the cheapest route, which returned via Brisbane but ironically resulted in more status credits and points. 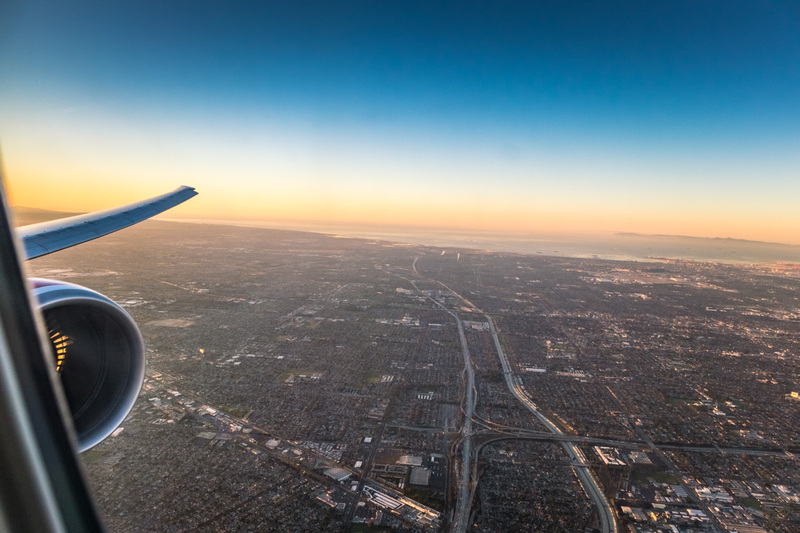 However, I had been monitoring awards on this flight for a friend who wanted to fly with me, and I found availability 3 days before departure — so it is possible, even on the Delta service. You can also use ExpertFlyer to set up award seat alerts. 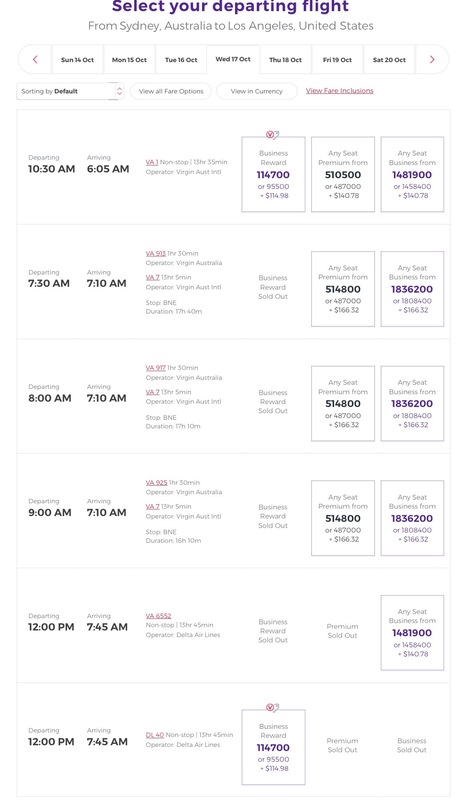 Virgin Australia has previously been excellent for its low taxes and charges (as shown above). 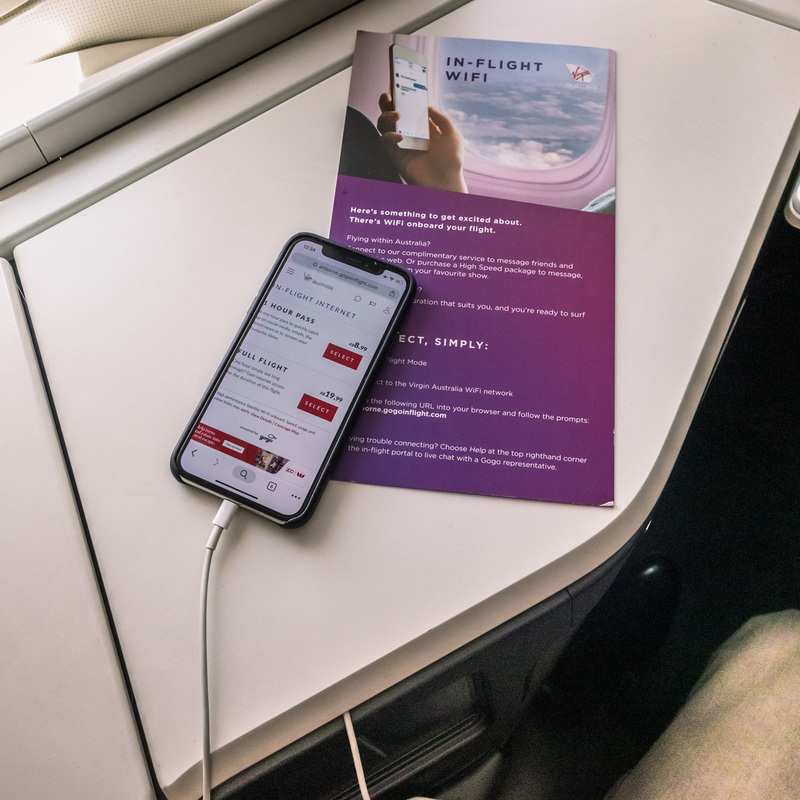 Literally en-route I was using the inflight Wi-Fi and saw the Virgin announcement on new “Carrier Charges,” which have since come into effect from 1 January 2019…and now add AUD $230 per segment in business class to the U.S. 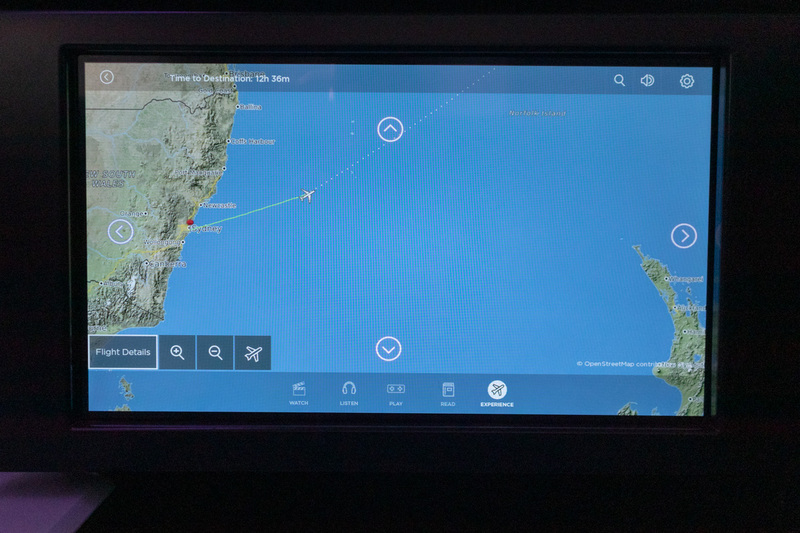 This review focuses on the outbound flight from Sydney to Los Angeles with brief coverage of the return flight to Brisbane. 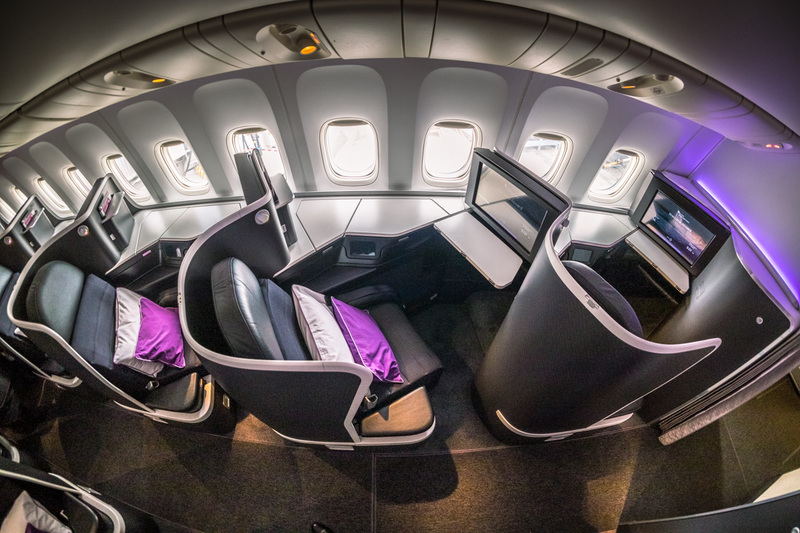 Hot Tip: Of course, you can book Virgin Australia Business Class using points, instead of cash! 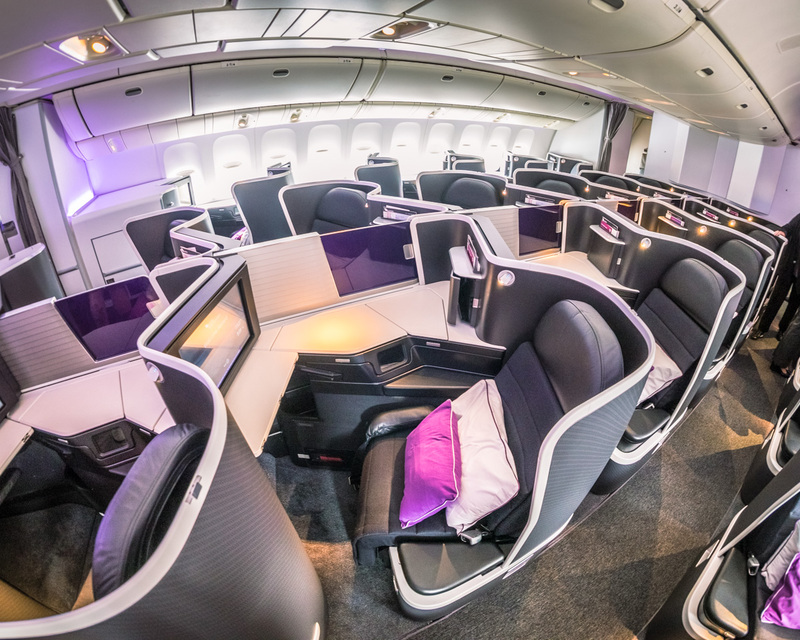 Read about all the ways that you can earn lots of Virgin Australia Velocity points to make your booking. 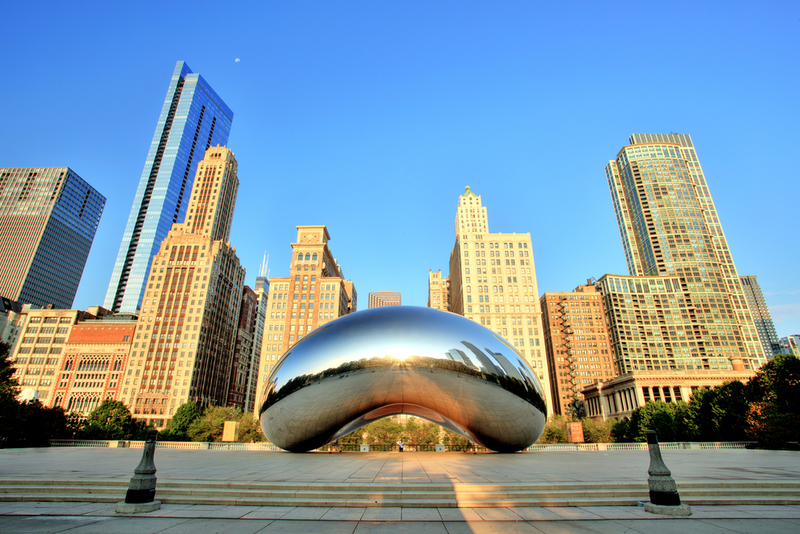 Marriott is a transfer partner of VA and is one of the options you have! 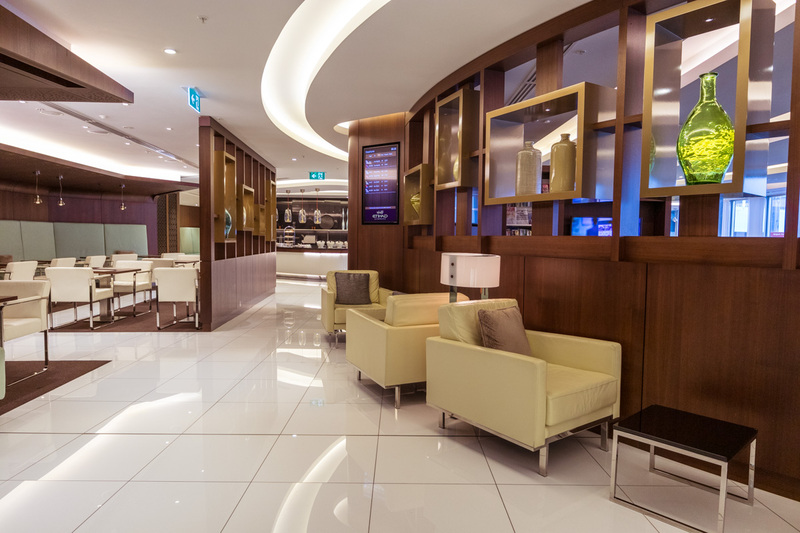 Prior to departure from Sydney, passengers traveling in “the business” can access the Etihad Premium lounge. 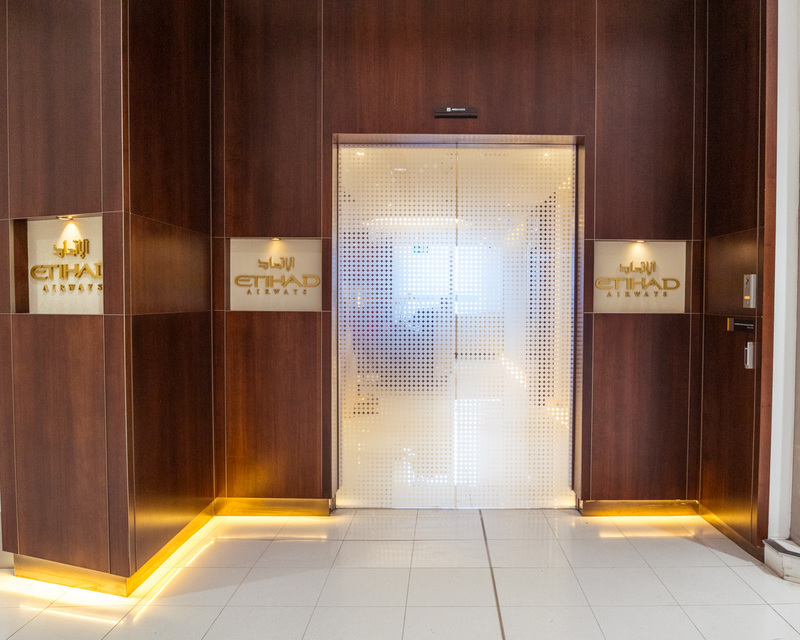 This has just been taken over by the UK-based No1 lounge operator, who has rebranded it ‘The House” (news of which was only announced the day of my departure). 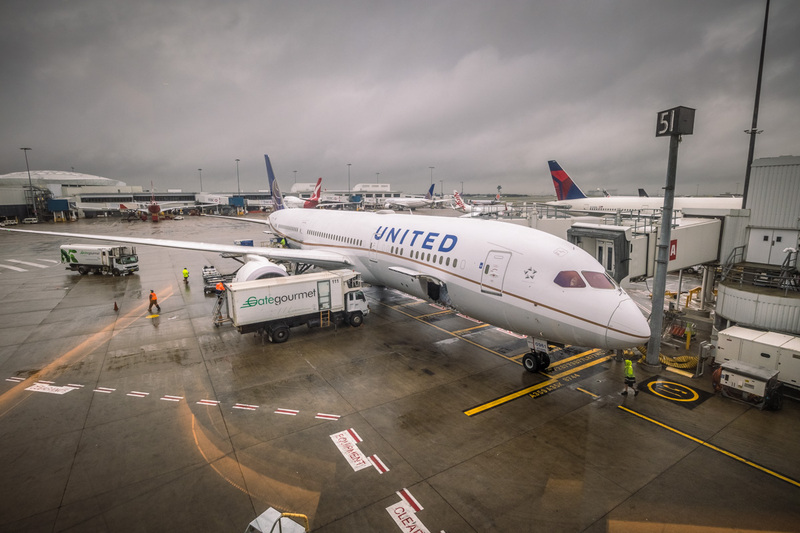 …with views out across the ramp. 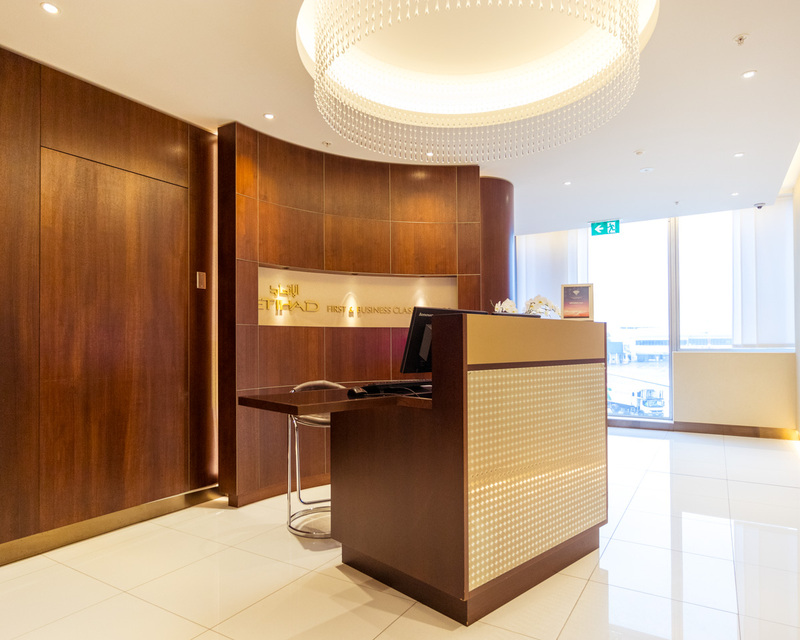 Around the corner, you’ll find a luggage storage service if you didn’t want to take your hand luggage downstairs. 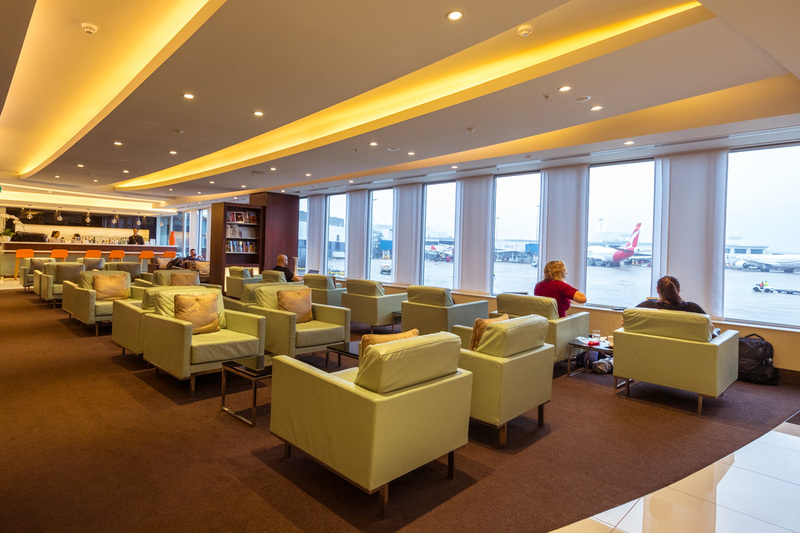 The main lounge area has clusters of 4 single leather seats facing each other, single seats facing the tarmac, and others located alongside the curved hallway wall. Again, you’ll find excellent views out to the ramp. 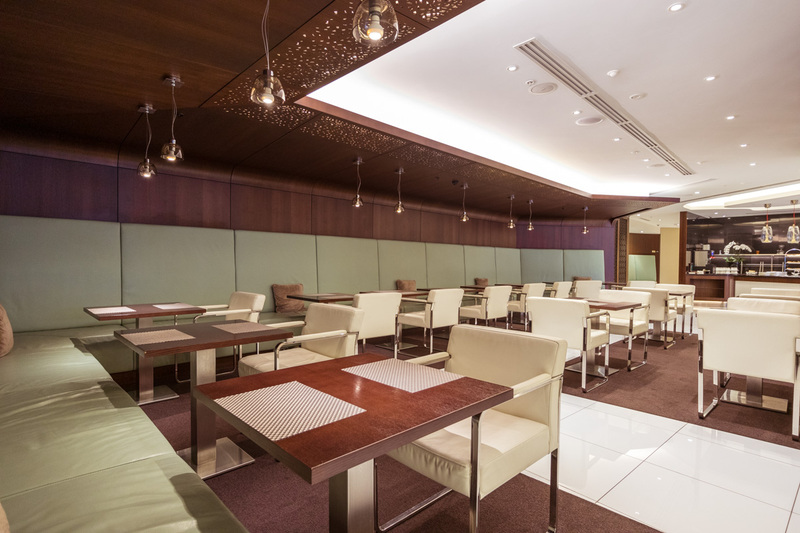 A bar table separates the dining area and the main lounge, and there are power points to charge your devices. 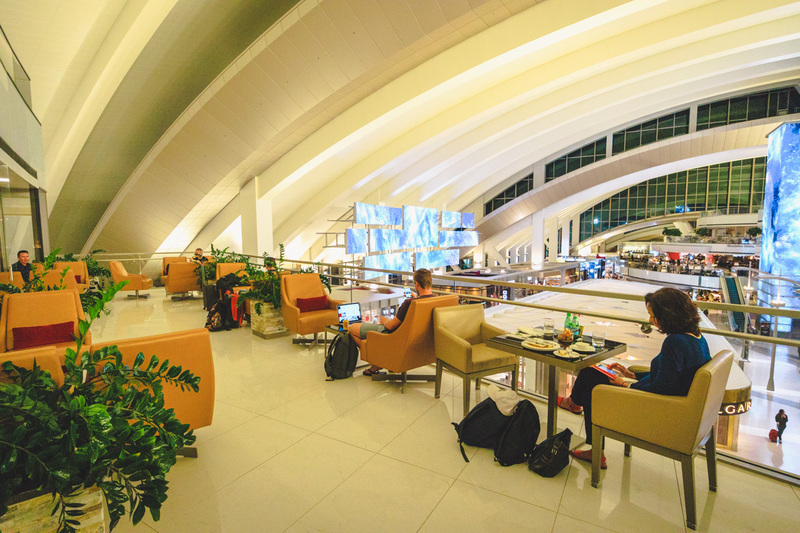 The lounge was relatively quiet throughout my stay. 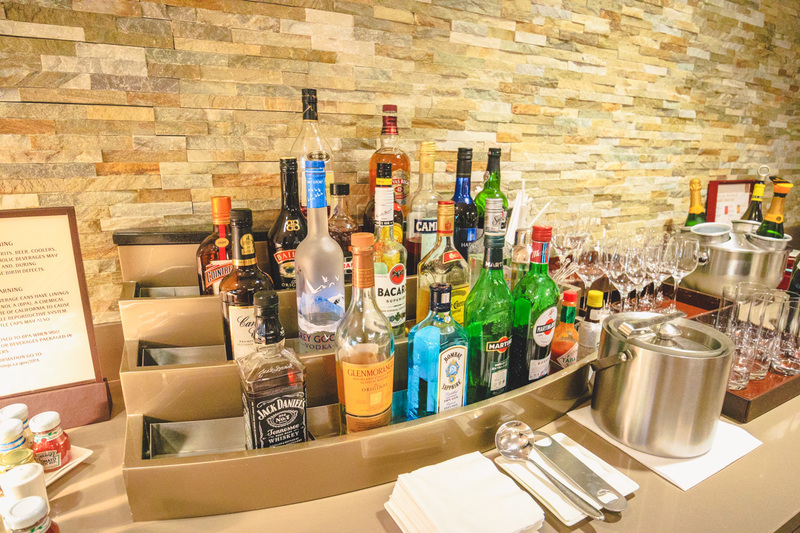 A tendered bar serving wines and spirits is located on the furthest wall of the lounge. 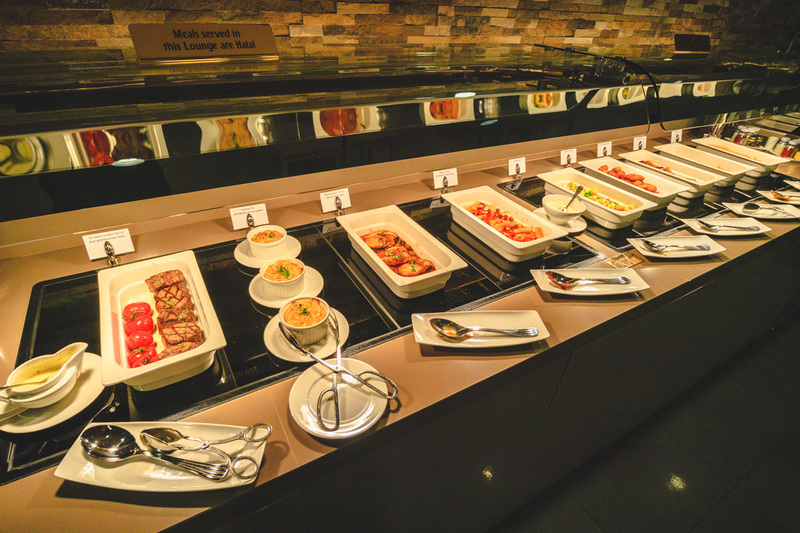 The buffet featured your standard hot and cold breakfast fare suitable for the morning departure. Since its conversion into ‘The House,” the lounge now offers à la carte breakfast options including eggs cooked your way, omelettes, and breakfast burritos. 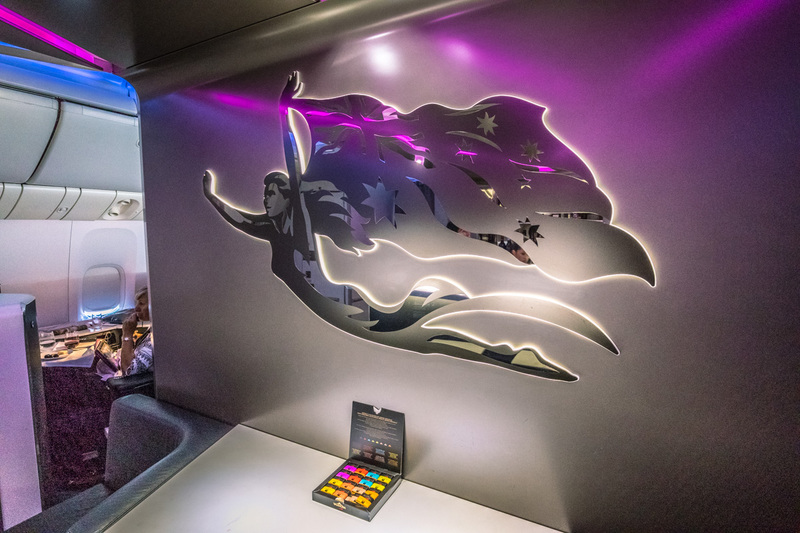 There is no barista making coffee like in the nearby Air New Zealand lounge, which Virgin Australia used to contract to before the “conscious uncoupling” of both airlines in 2018. 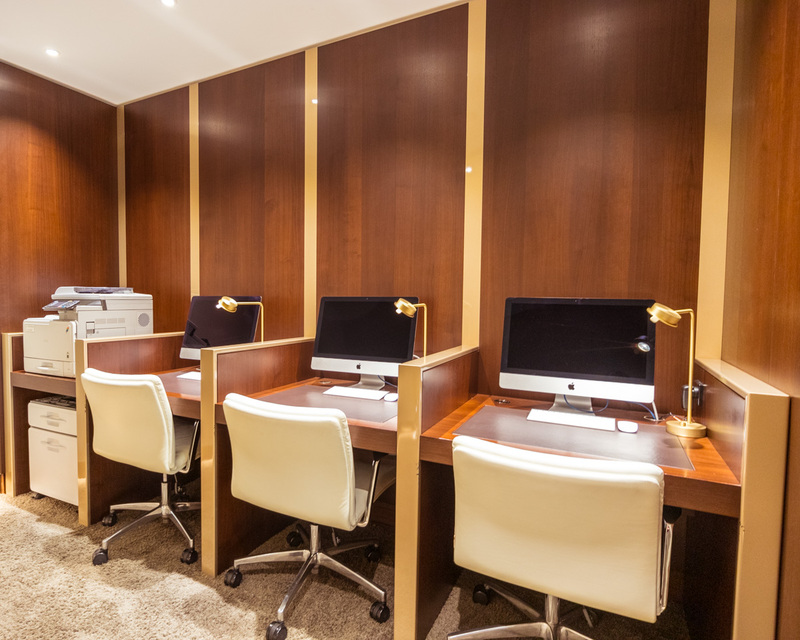 For the adults, there is a business center featuring Mac computers. But the complimentary Wi-Fi throughout the lounge was pretty much unusable at 0.24 Mbps down and 0.11 Mbps up. 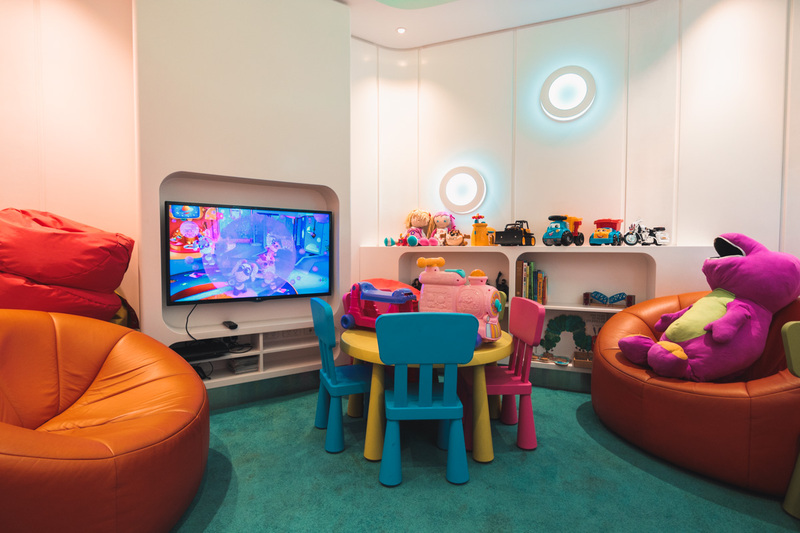 And for the kids (or kids at heart), there is a playroom full of toys, games consoles, and a TV to keep them occupied. 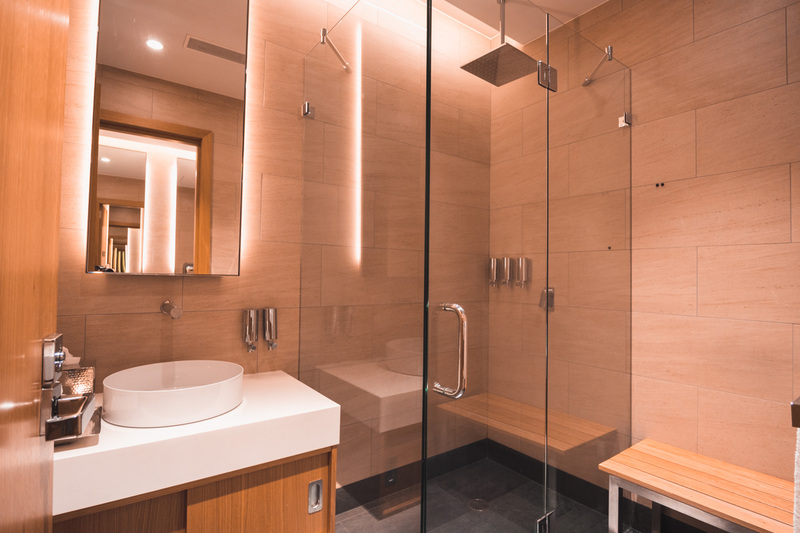 A single shower is available in the men’s and ladies’ bathrooms, which also have adjacent prayer rooms. 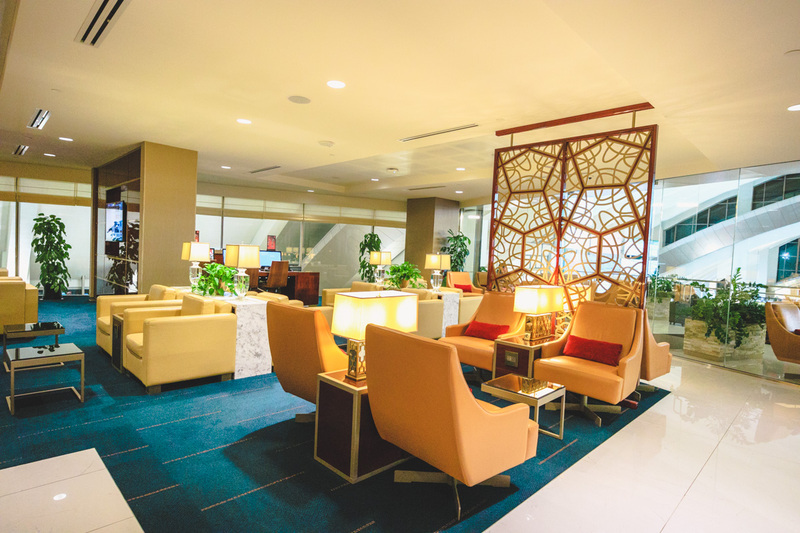 Overall, the Etihad Lounge is a great place to work, relax, grab a bite to eat, and even play (for the kids) before the 13-hour flight to LA. 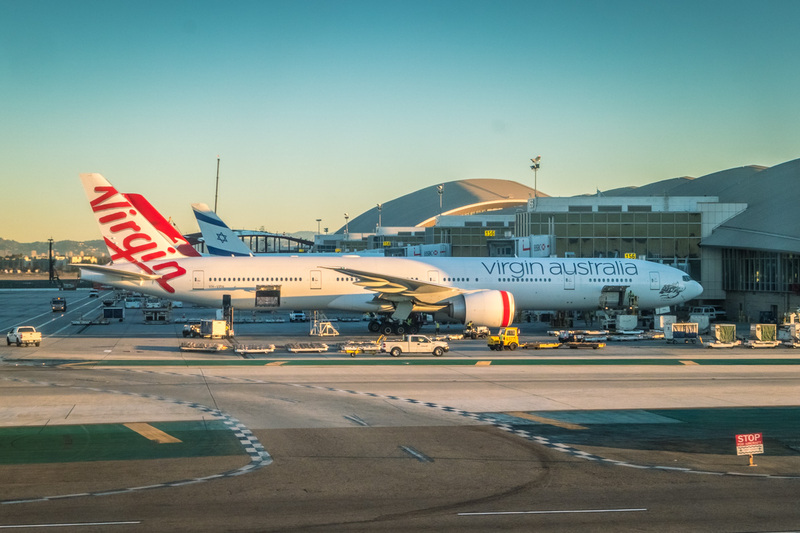 Virgin Australia currently has just 5 Boeing 777s in its fleet, which only fly between Sydney, Melbourne, and Brisbane to Los Angeles. 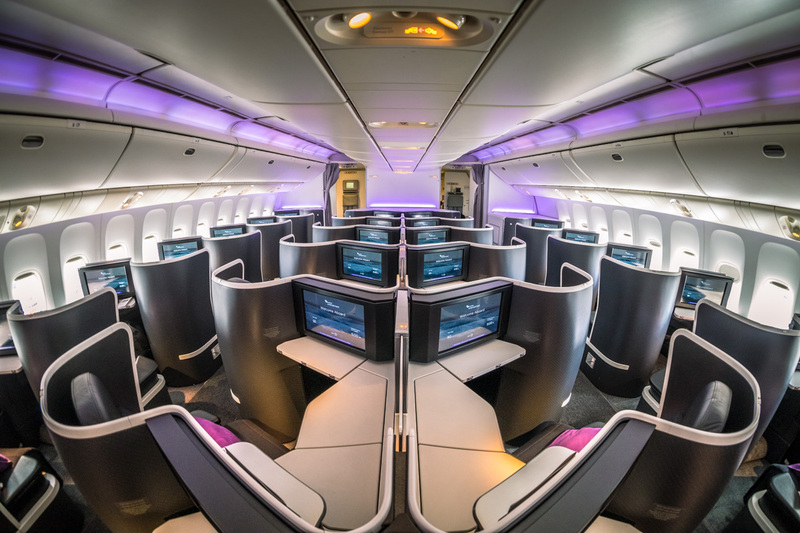 All aircraft feature 37 business class seats (dubbed “the business”), 23 premium economy seats branded “Premium,” and 278 seats in economy – 57 of which are branded “Economy X” and offer extra legroom with at least a 34-inch pitch. My aircraft, VH-VOZ, was delivered in January 2009 and received a refit with the latest cabin products in August 2016. 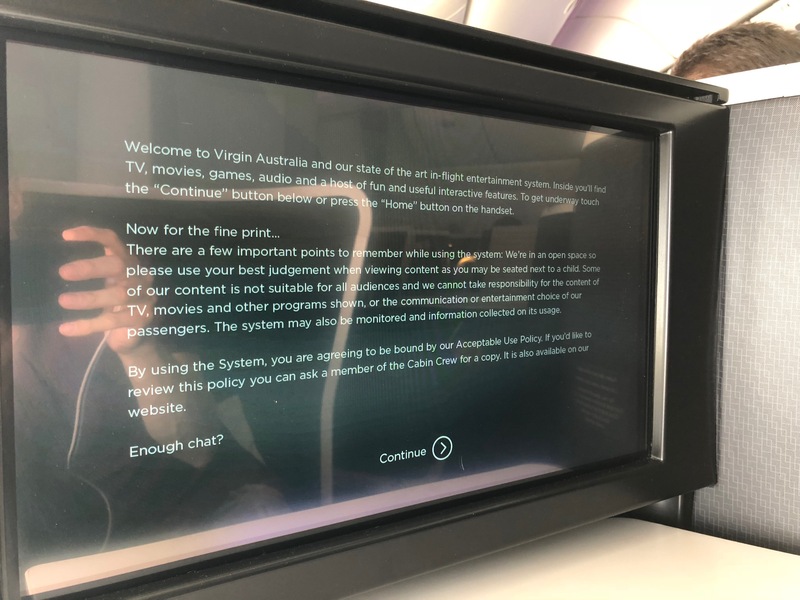 When Virgin Australia refitted these aircraft, they bucked the trend of squeezing more seats into economy and have retained the 3-3-3 abreast (and also increased the pitch in Premium to 41 inches). 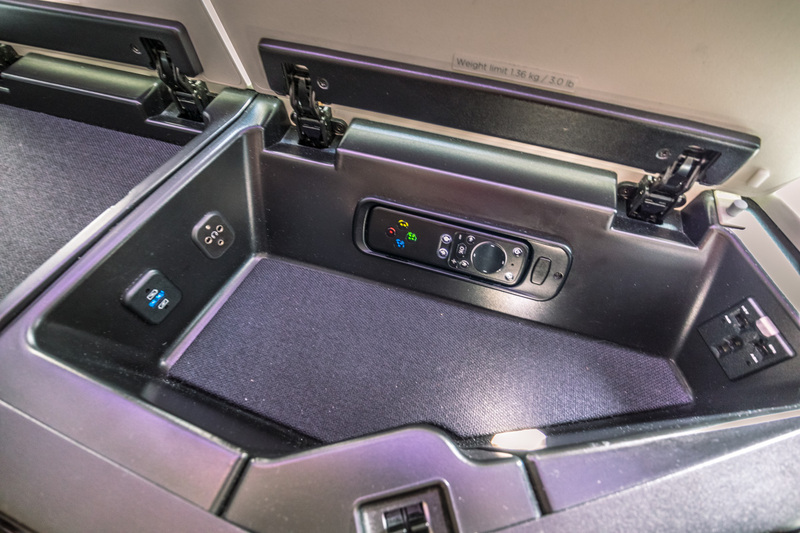 Stepping onto the aircraft, you’ll be amazed at the cabin styling. 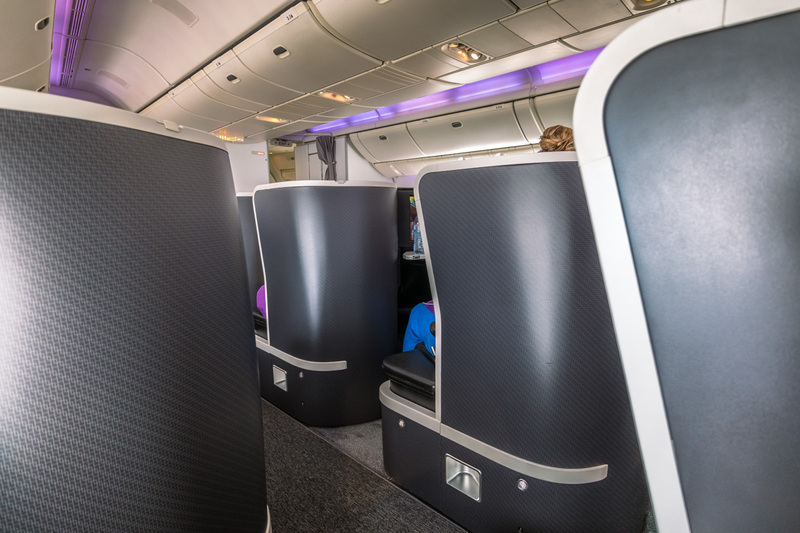 The charcoal fabric seat covers, carpets, and black-textured seat shells contrast beautifully against the silver trim, and are complemented by white storage covers and a large white pillow on the seats. 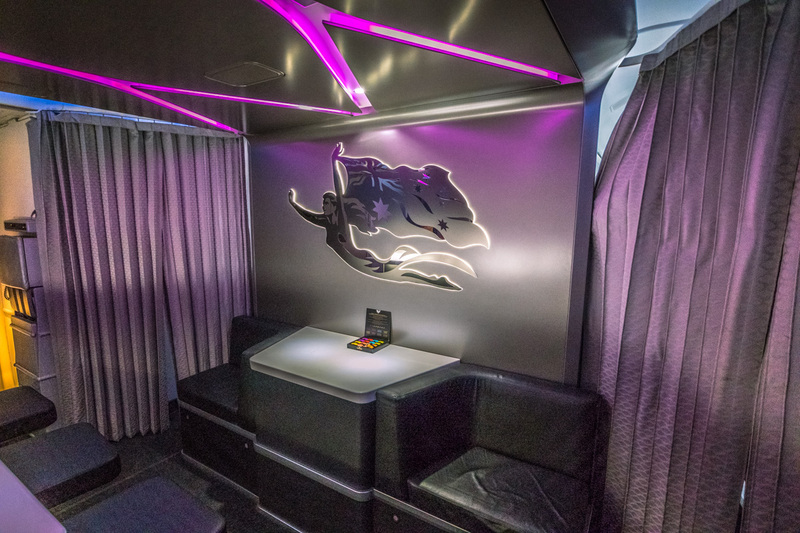 Bursts of purple are introduced with a smaller lumbar pillow plus purple mood lighting overhead and on the bulkhead. 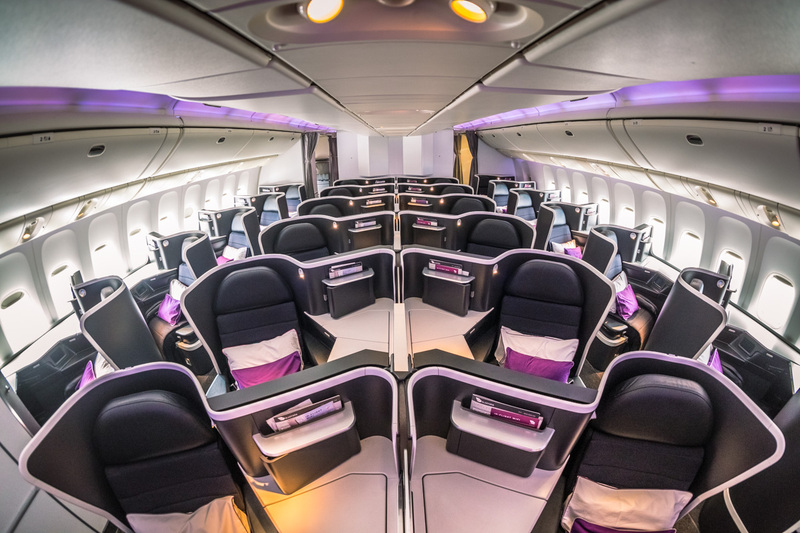 Purple privacy dividers between the middle seats and individual spotlights are all positioned to highlight the seat cushions. 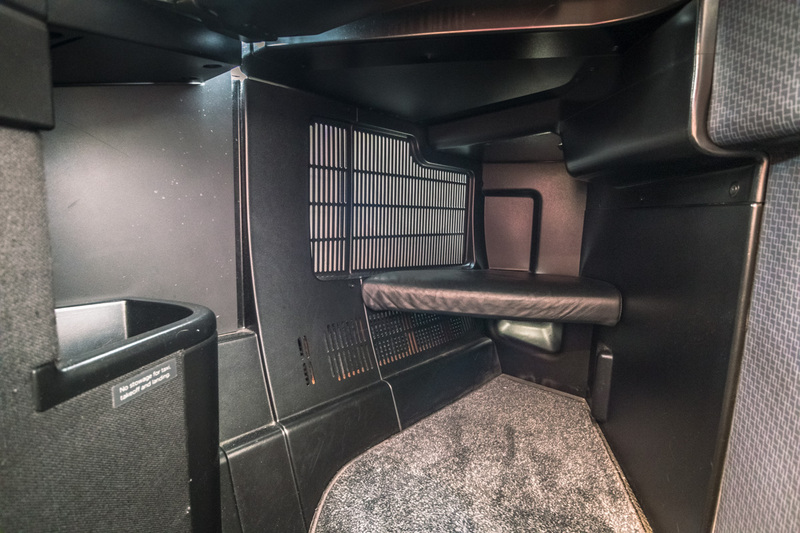 All these stylistic features combine to give you that “wow” moment when you step onboard. 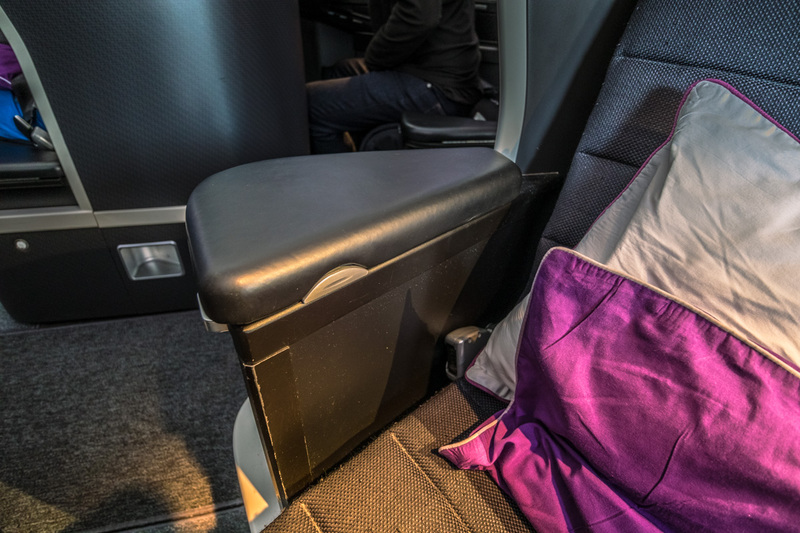 You’ll also notice that there is no mountain of bed linen sitting on your seat waiting for you like some other carriers – but more on that later. 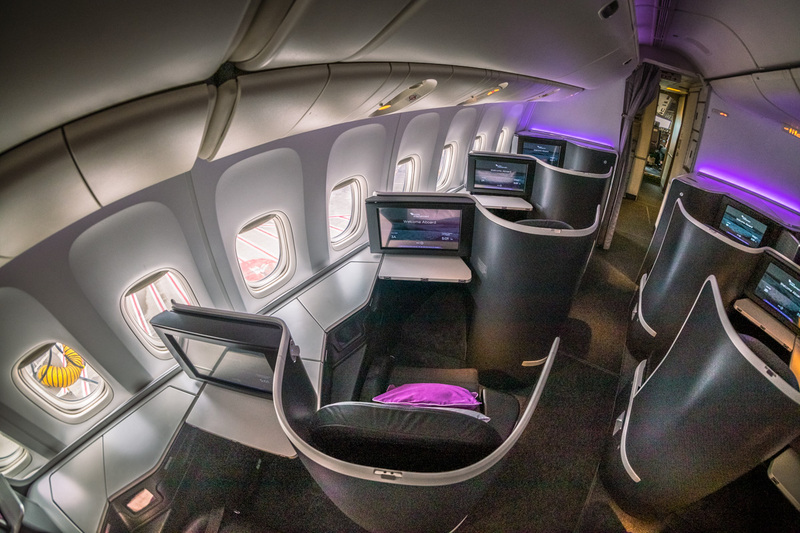 Virgin Australia uses the highly-regarded B/E Aerospace (now Collins Aerospace) Super Diamond reverse-herringbone seats that can also be found on Air Canada, Qatar pre-Q Suite aircraft, newer American Airlines aircraft, and other carriers — but these are still styled specifically to Virgin Australia’s playful brand image. 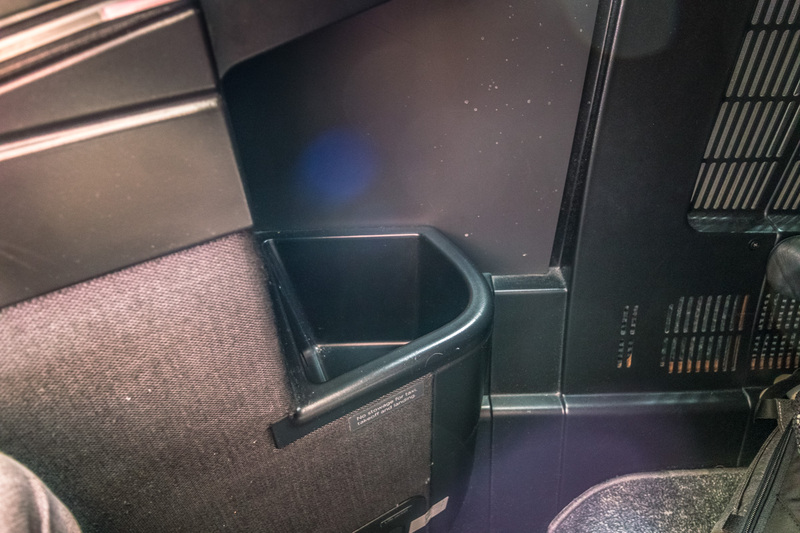 All seats have direct aisle access, and the middle pair has an adjustable privacy divider. Two storage compartments provide space to store your electronic devices, wallets, watch, and (in my case) some camera lenses. 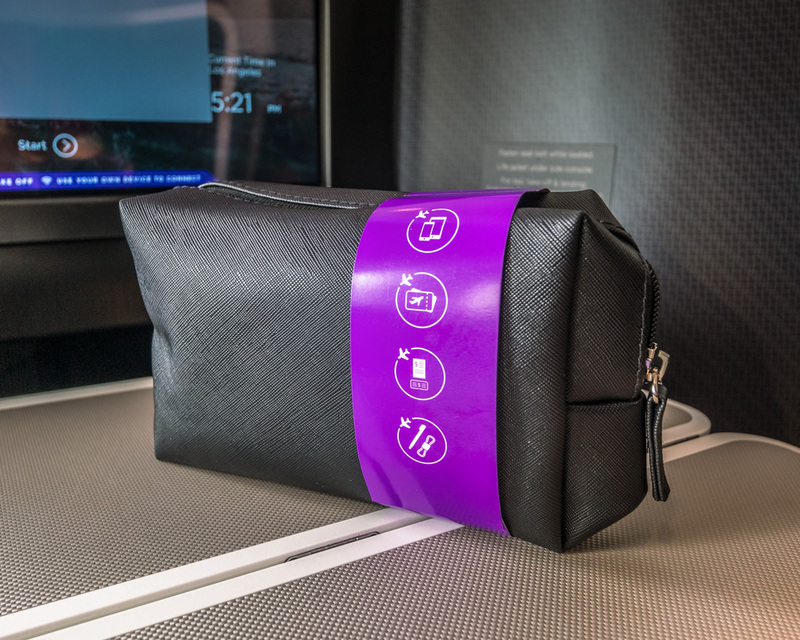 The power socket, USB port, headphone socket, and IFE remote are also housed in the larger of the 2 compartments. 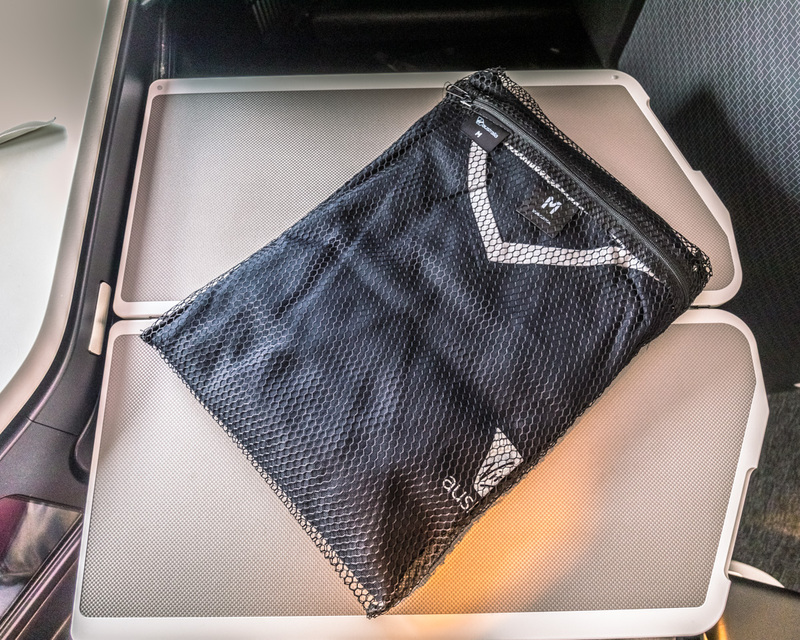 An open storage compartment along the window toward the floor can easily fit the supplied amenity kit and folded PJs. The foot cubby is a decent size for a reverse herringbone layout. 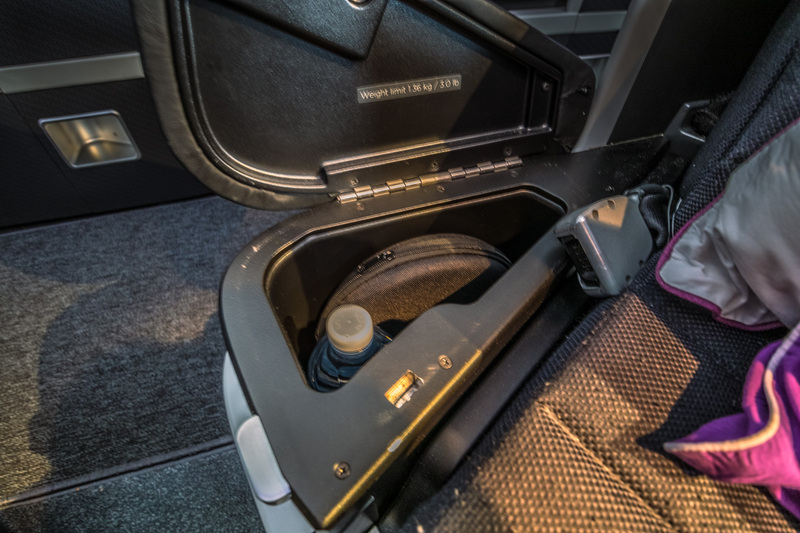 A manually height-adjustable armrest (unlike Qatar Airways’ motorized version in their Super Diamond Seat) houses your noise-canceling headphones and a water bottle. A smaller storage pocket that could hold a tablet sits in front of the literature pocket with a feature light attached. 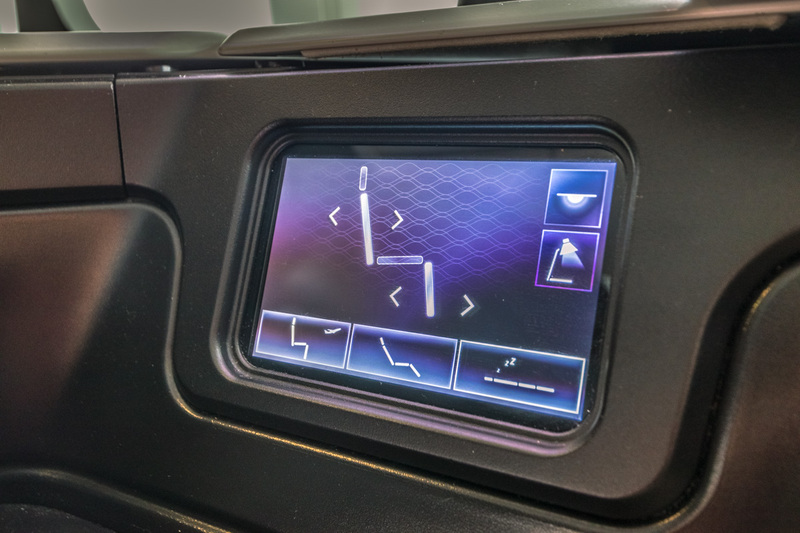 The seat is adjusted via a touchscreen and includes presets for take-off/landing, lounging, and sleeping, as well as controls to adjust the feature light and spotlight. 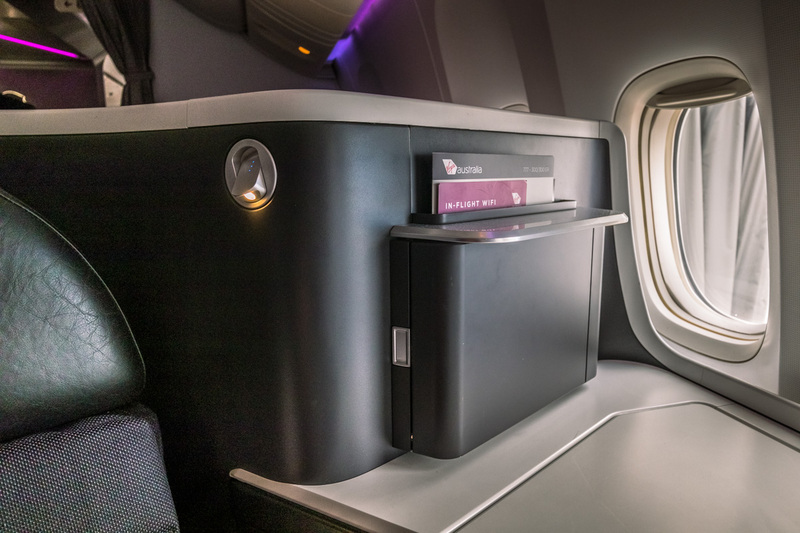 The seats provide excellent privacy with the wrap-around shell, unlike the Qatar Airways version where you feel quite exposed to the rest of the cabin. 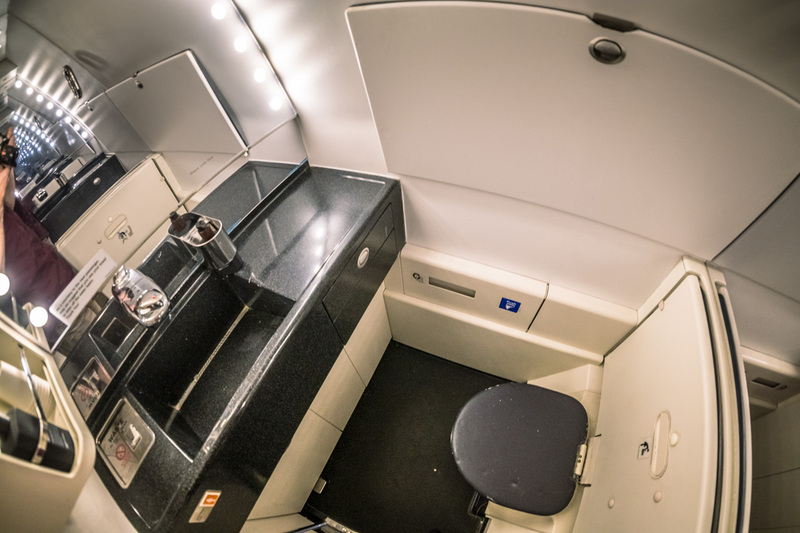 Two lavatories are located at the front of the aircraft, plus one on the right side adjacent to the bar. I loved the fact they play Australian music through the speakers in the bathroom to mask any bathroom noises. 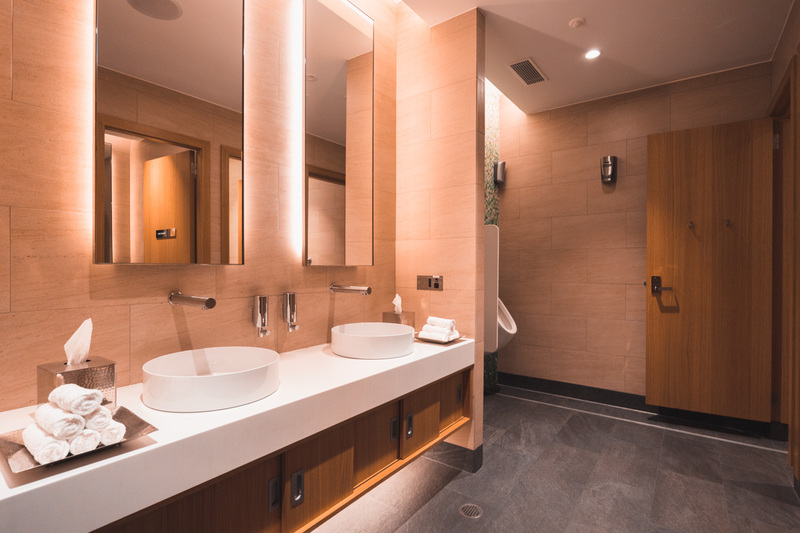 With 3 lavatories for 37 guests, I never had to wait long (if at all) to use a bathroom. 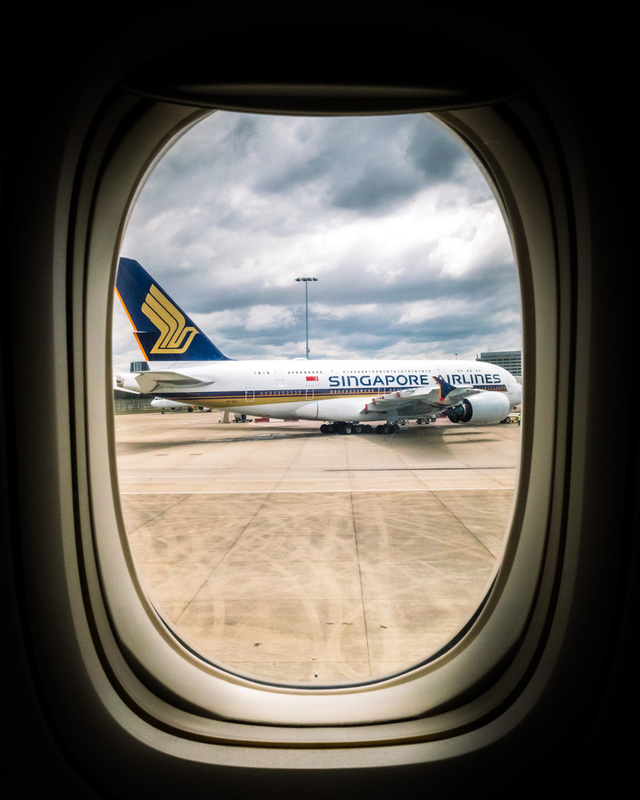 On push-back from Sydney airport, I captured one of Singapore Airlines’ newest A380 aircraft, which I recently reviewed here. 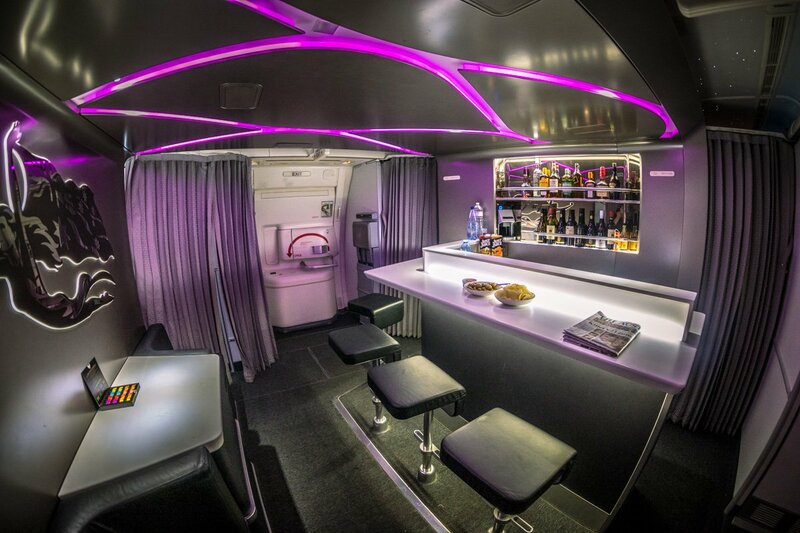 The standout feature on this aircraft is the bar at door 2 in between the business class cabins. 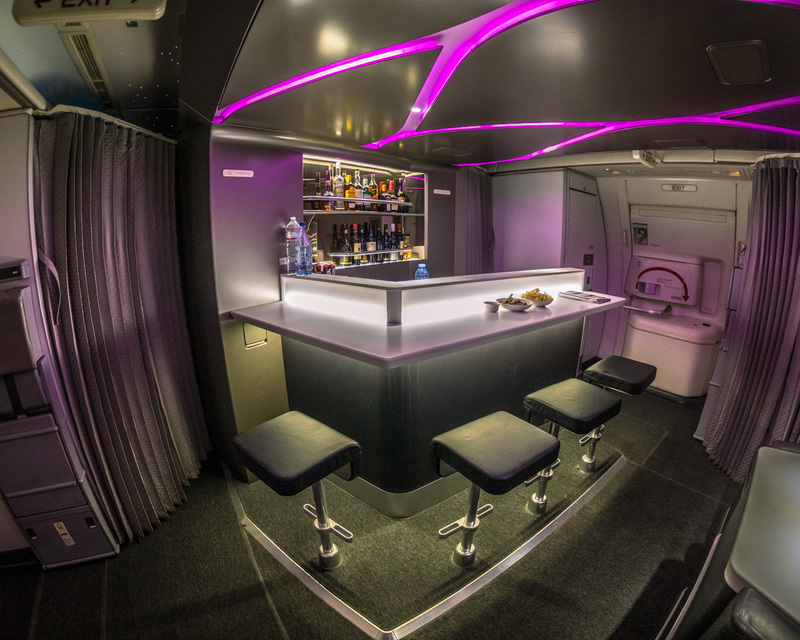 Virgin Australia is currently the only carrier to install a sit-down tendered bar on a Boeing 777, and they’ve done a spectacular job with it — it not only looks amazing, but is also very functional. 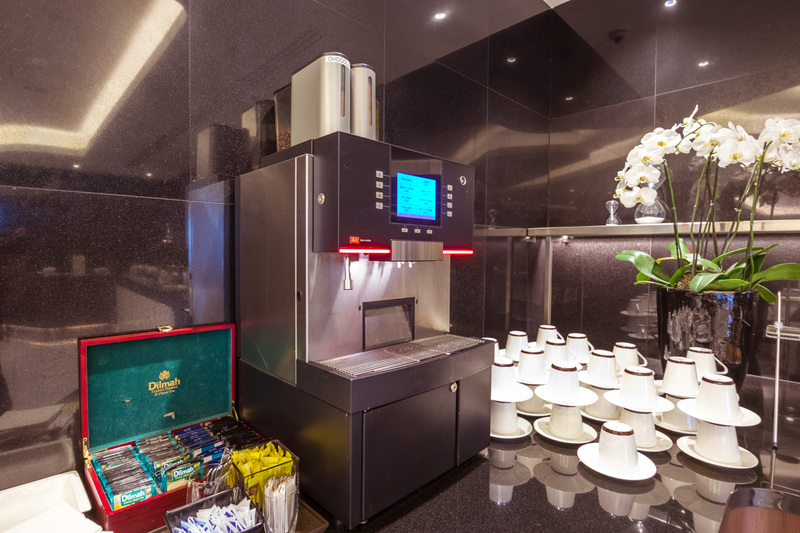 The crew use it as a preparation area during meal services and open it up as a bar after the main service. 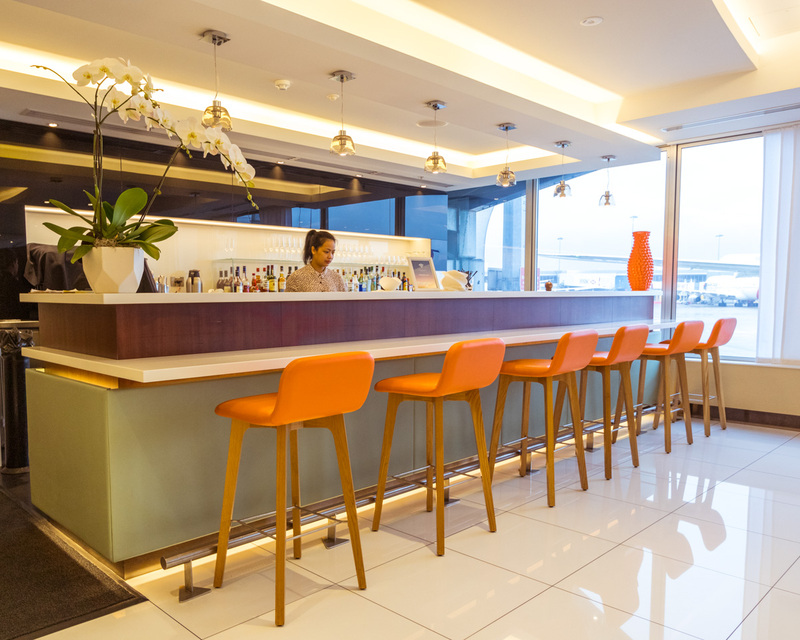 Four stools are located around the backlit bar, with funky overhead LED lighting that mimics the roof patterns of the Virgin domestic lounges around Australia. 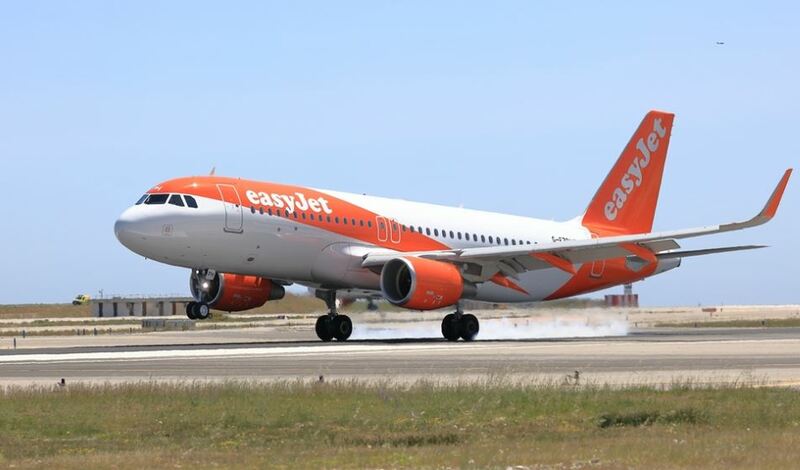 It’s a fantastic place to stretch your legs and spend a few hours chatting to the friendly crew and getting to know your fellow passengers. Another 2 seats are located on the opposite wall separated by a table. 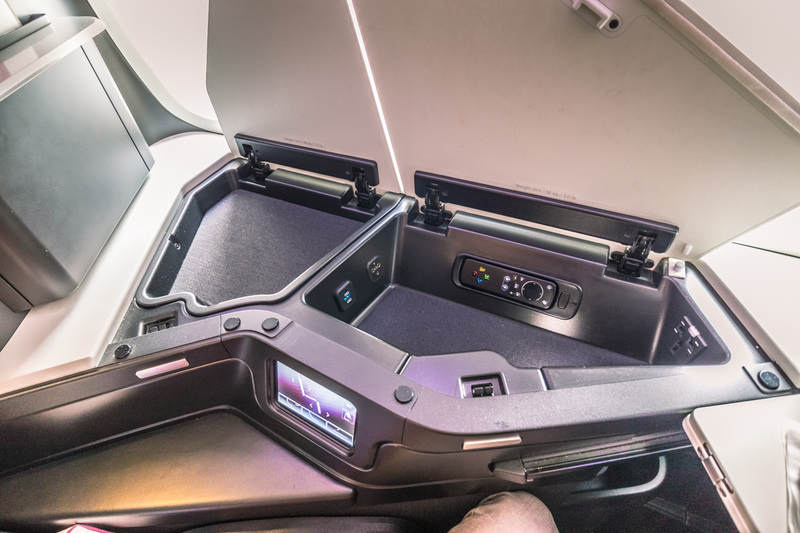 Interesting fact: underneath that table is the foot cubby of the middle seats on the opposite side of the bulkhead (a clever use of the space). 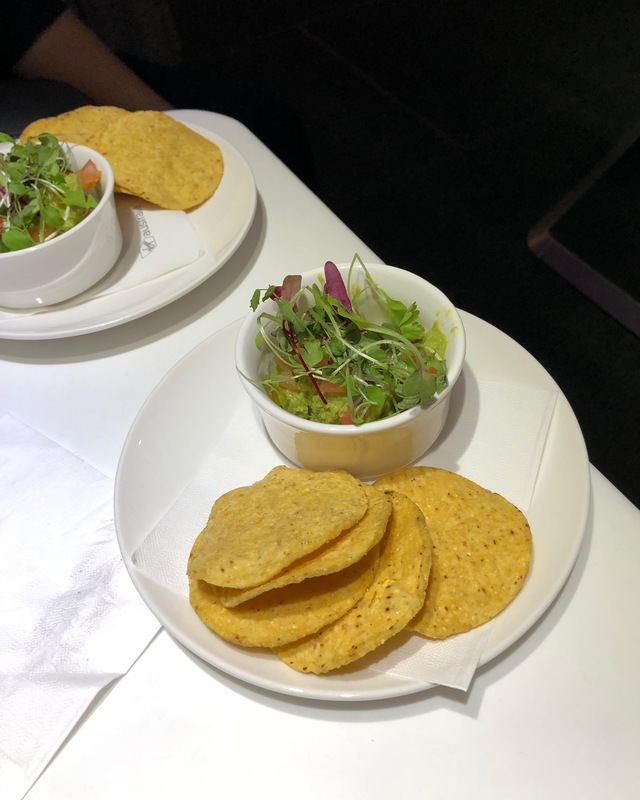 Tip: order the guacamole with jalapeno salsa and corn chips — it is amazing, and I ended up ordering another 2 servings to share with the new friends I met onboard. The crew will set up your bed and have it ready in the time it takes you to slip into your PJs in the bathroom. 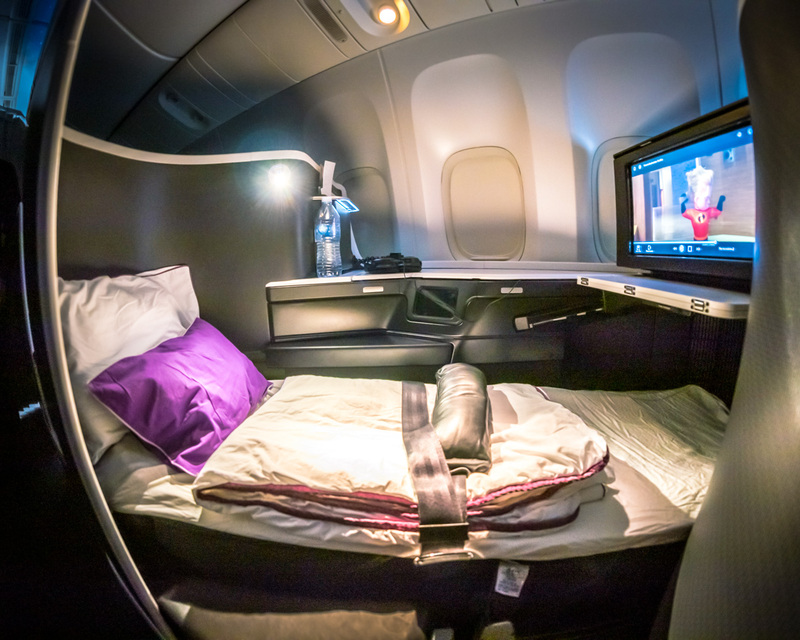 As you return to your seat, there will be a thick mattress pad, soft duvet with on-brand purple trim, 2 pillows, and a bottle of water waiting for you. Laying in bed, you’ll have a constellation of LED stars shining above you as you drift off to sleep. 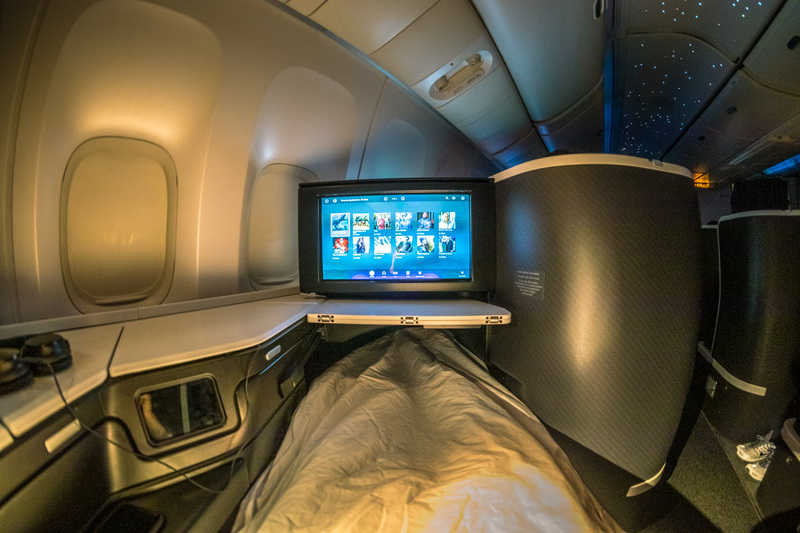 The bed will be more comfortable for people who sleep on their back rather than those who sleep on their side, since the tray table under the IFE screen may restrict your movement depending on your body size. Overall, I managed to get 6 hours of solid sleep. Black PJs are also provided, which have silver trim and a foil heat transfer pocket print — but no slippers. 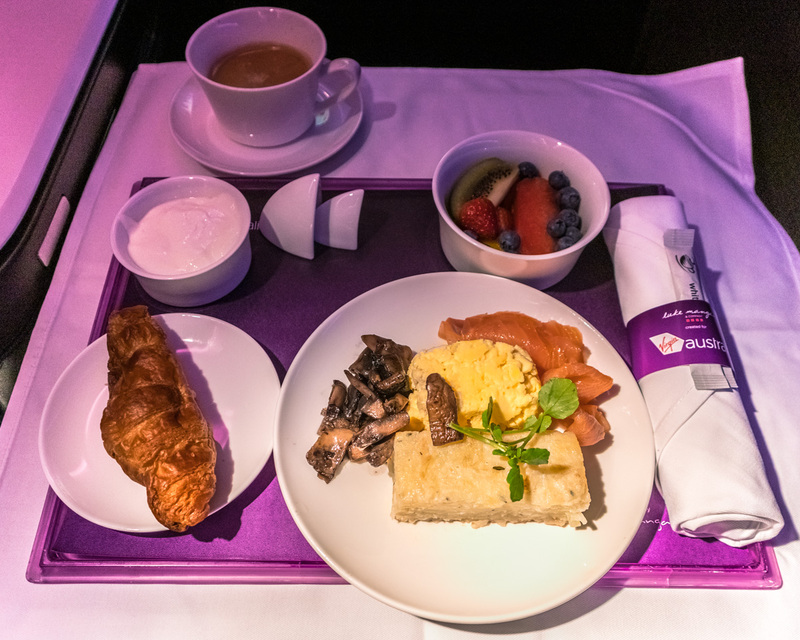 The meal service is another area in which Virgin Australia excels, thanks to its partnership with renowned Australian chef Luke Mangan for its business class food and beverage. Before takeoff I was offered a choice of Ayala Brut Majeur champagne (worth approximately US $40 a bottle on the ground), orange juice, or water. 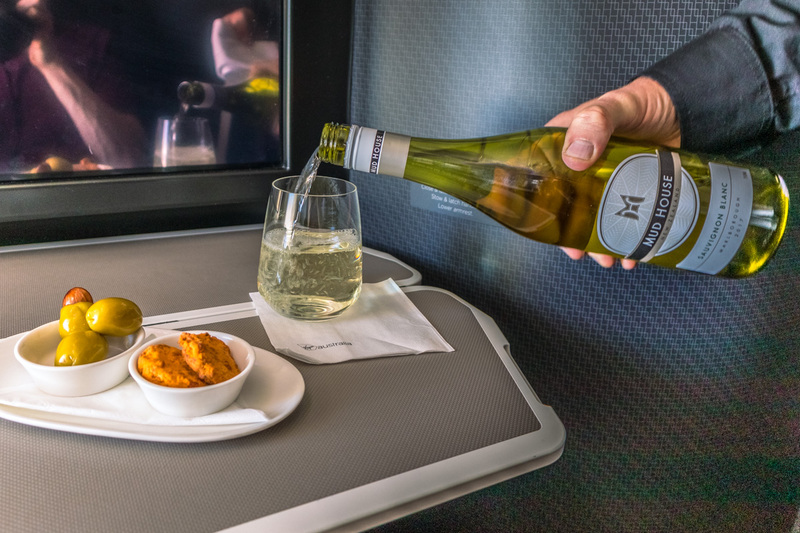 After takeoff, savory sun-dried tomato and parmesan biscuits and almond-stuffed olives are served with your choice of beverage. I selected the 2017 Mud House Sauvignon Blanc from Marlborough in New Zealand (US $13 a bottle). 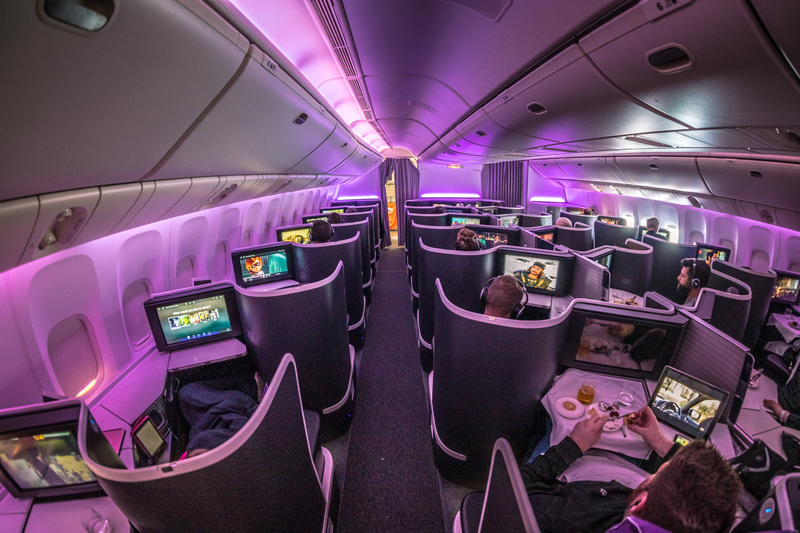 Virgin Australia doesn’t run trolleys through the cabin or use meal trays for the main meal service; instead, the crew provides a restaurant-style dining experience where your tray table is set. 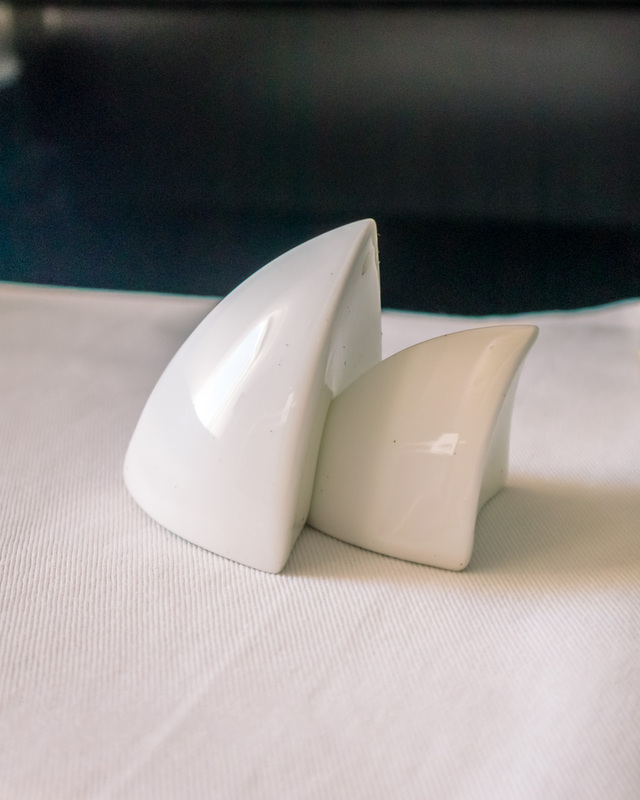 They lay a tablecloth, place the individual cutlery, and bring your glasses and side plate — along with one of the cutest salt and pepper shaker sets I’ve seen in the shape of the Opera House sails (second cutest would be Virgin Atlantic’s Wilbur and Orville planes). The meal service kicks-off with a choice from the artisan bread basket including garlic, white, and wheat bread. 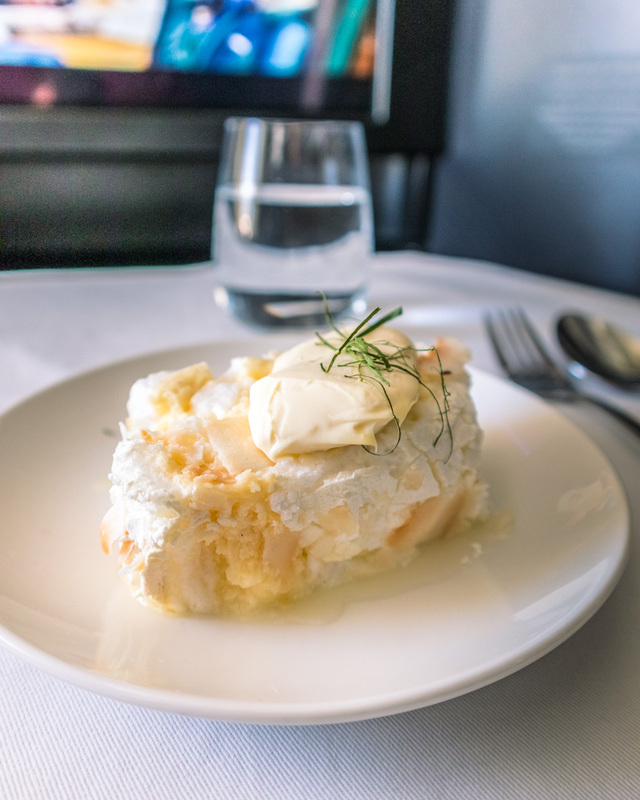 It’s frustrating when airlines serve you rock-hard or frozen butter that’s impossible to spread on your bread — but Virgin Australia always seems to consistently serve its butter chilled and ready to spread. 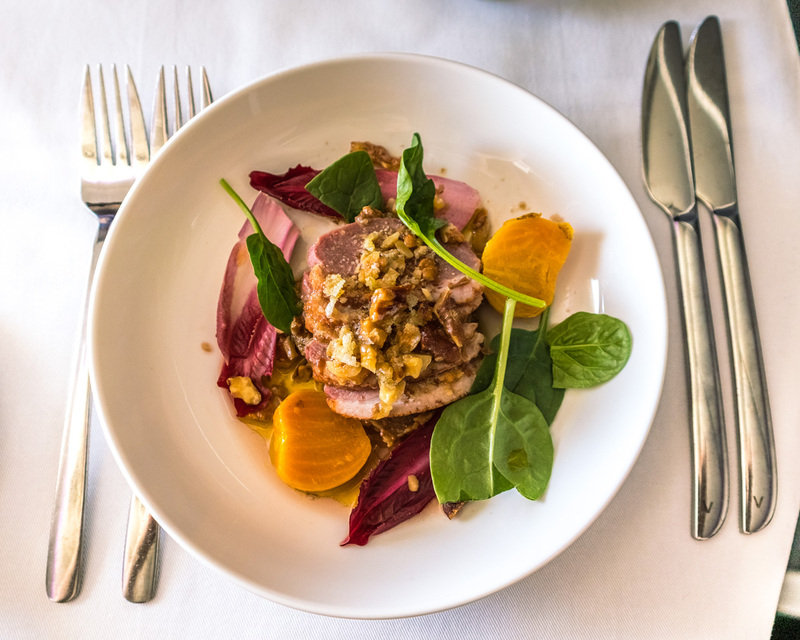 For a starter, I selected the smoked duck salad with radicchio, beetroot, and fig — which was full of flavor. For a main I couldn’t pass up the slow-cooked lamb shank with tomato, paprika, and potato and ricotta gnocchi. It sounded amazing and definitely delivered — the lamb was divine, just melting in my mouth. This was one of the nicest business class lunches I’ve enjoyed. 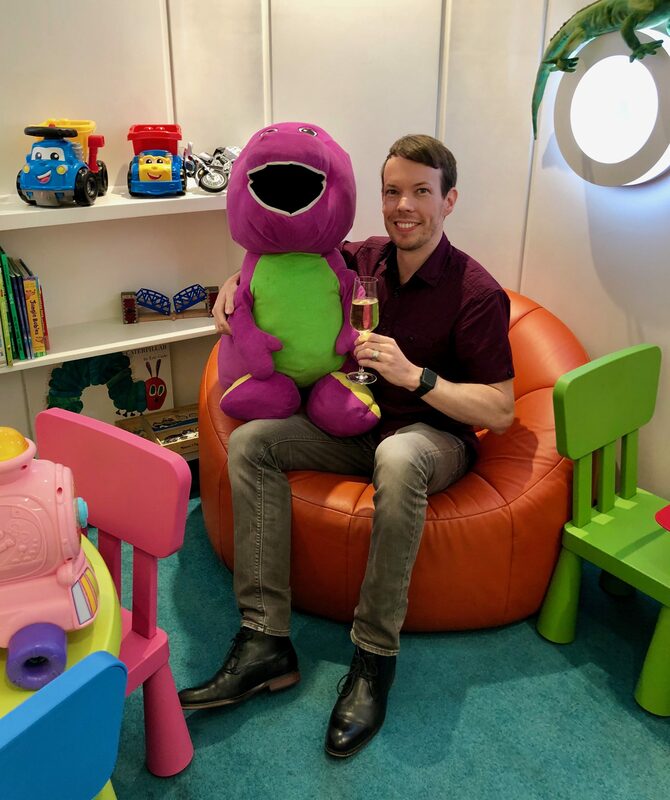 I also switched to 2016 Hardys The Magic Stick Shiraz from McLaren Vale, which was created specifically to be enjoyed at altitude and cannot be purchased on the ground. For dessert I opted for the mango and coconut roulade with kaffir lime and crème fraiche, which was the perfect way to finish off this meal service. Breakfast commenced 2 hours before arrival into Los Angeles. 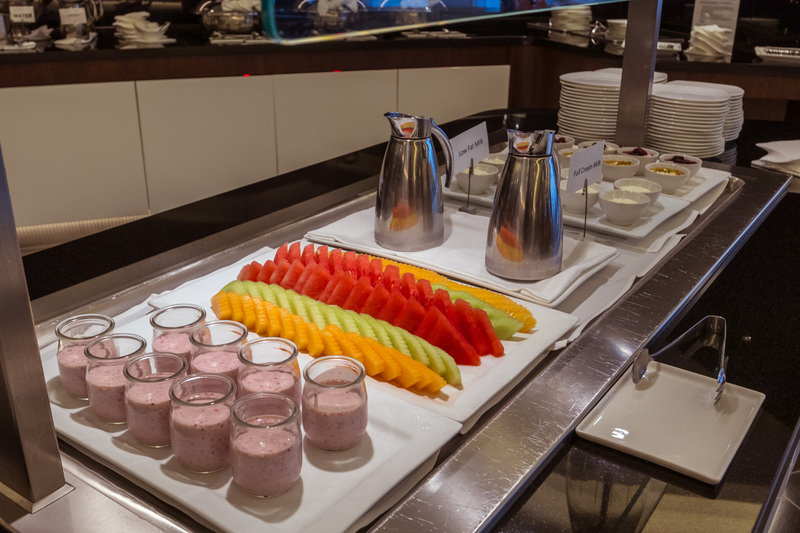 Prior to the main meal service, the crew will collect your completed breakfast “wake-up card,” which allows you to document all your choices and whether you wanted to be woken up or not. I selected the scrambled eggs with a side of sautéed mushrooms, smoked salmon, celeriac potato cake, croissant, and seasonal fruit with natural yogurt. Unfortunately, the potato cake was flavorless and everything else was fairly standard airline breakfast fare. The standout though is their Nespresso coffee, which is by far the best coffee I’ve ever had on an aircraft. 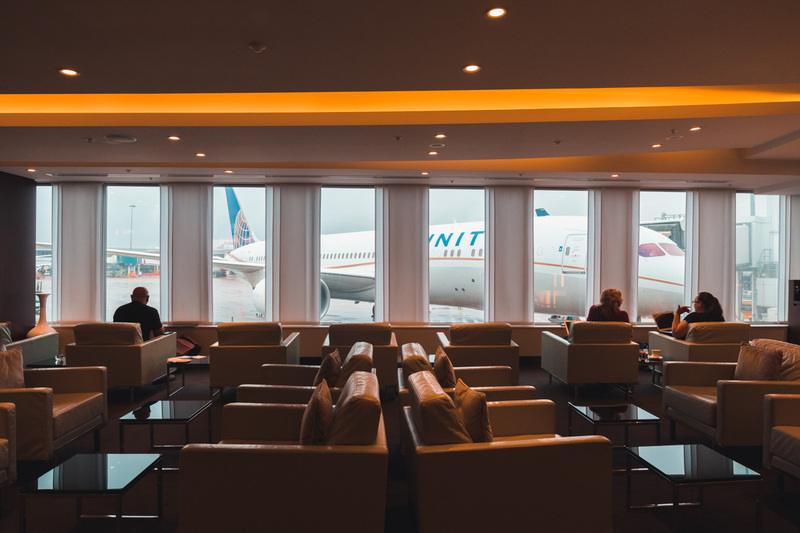 The restaurant-style service does take longer than a production-line trolley service on other carriers, but with 13 hours to spare there’s plenty of time. 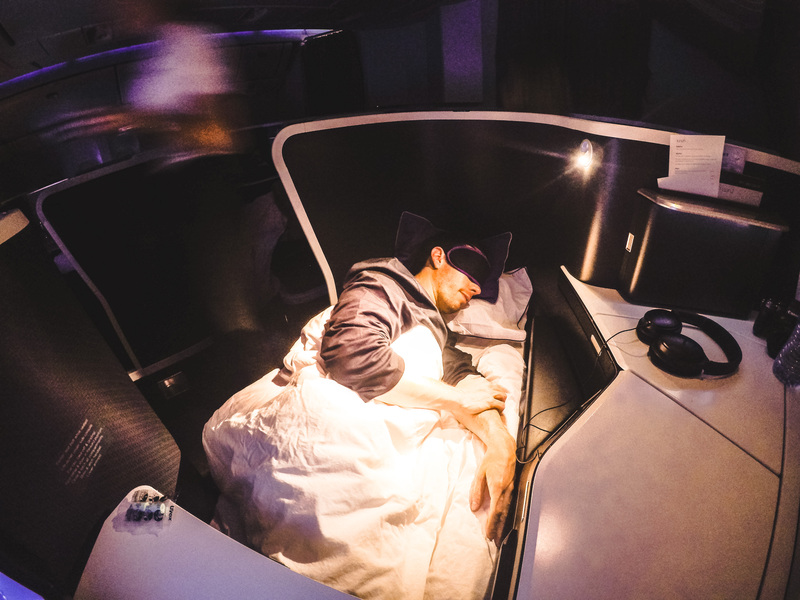 If sleep is your priority, there is an “Express Dining” option also. Aside from the pretty standard breakfast, the main meal service was exceptional and couldn’t be faulted. 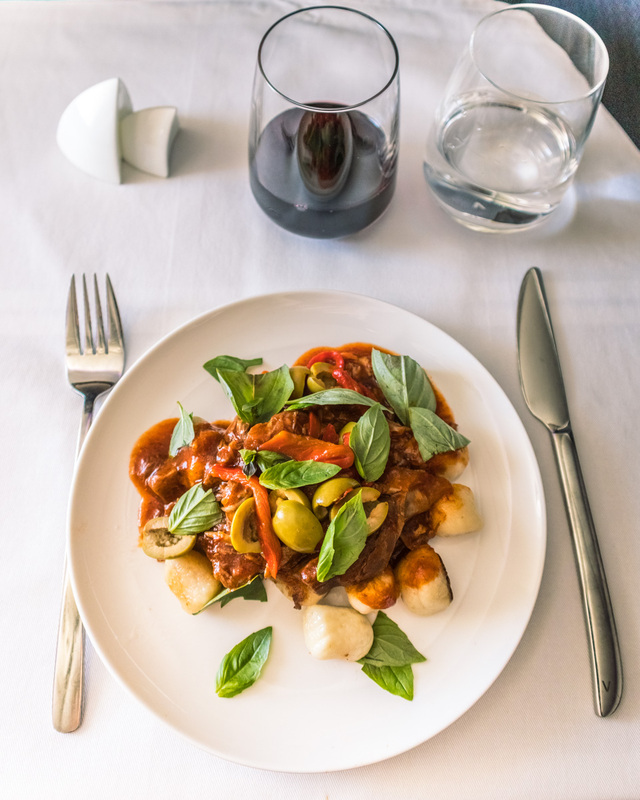 Although Virgin Australia doesn’t offer an order-before-departure meal selection service, you won’t be disappointed by the onboard options. 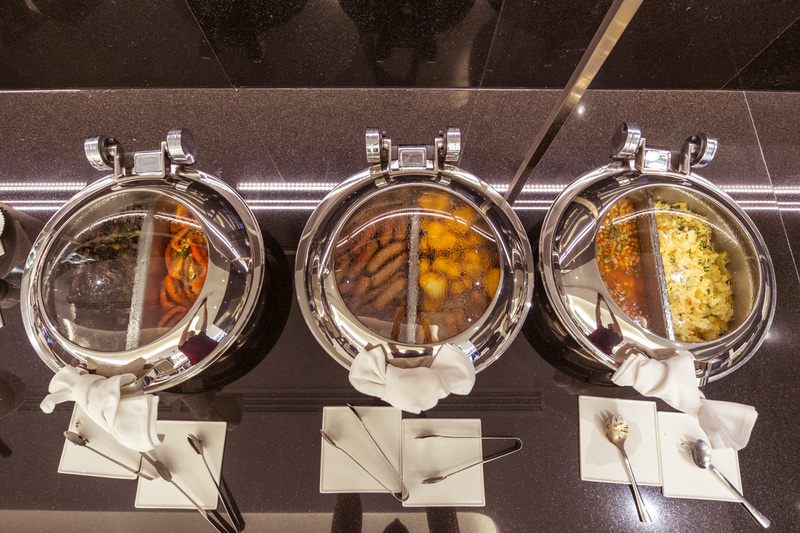 The most challenging part will be selecting from all the delicious-sounding dishes! 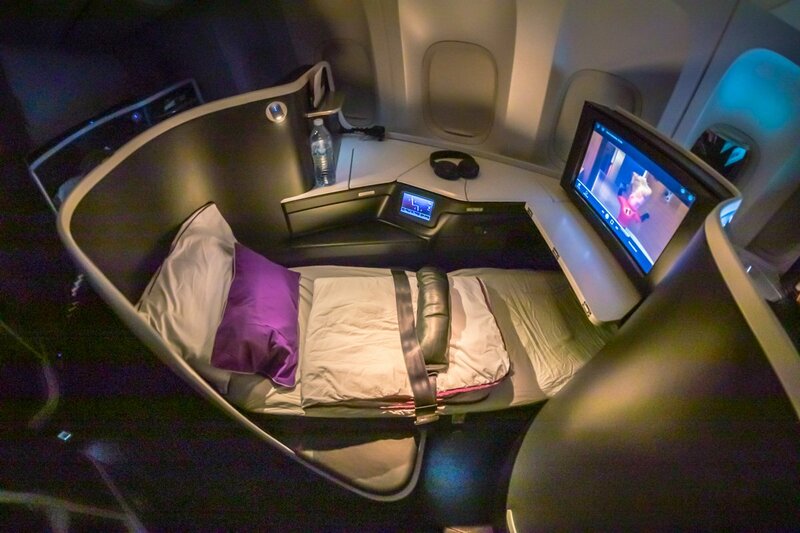 Virgin Australia service is genuinely warm and friendly with no fake pleasantries. The cabin service manager, Mark (who I later noticed stars in the Virgin safety demonstration video) introduced himself when I boarded and mentioned that Alana would be looking after me on the flight. Later when Alana introduced herself, she asked if she could call me Gregory (my official name usually only used by my Mom), which I happily agreed to since I find Mr. Stone too formal. During the post-take-off refreshment service, I never received my wine with the snacks. While I was walking through the cabin, Mark asked, “Is everything ok Mr. Short?” I didn’t correct him, but I mentioned I was still waiting on my wine. He apologized and rushed to the galley. Alana quickly appeared through the curtain with the missing wine and a sincere apology, saying how Mark told her she had to take extra special care of me on this flight but she felt she’d already failed at that. I put her mind at ease by telling her it wasn’t a big deal, and mentioned that at least she hasn’t been calling me “Mr. Short” — we had a good laugh. She thought it was hilarious and rushed to tell Mark his mistake. Mark soon appeared at my seat to apologize again, but I mentioned that I’m not precious about these things and thought it was funny. Mark continued to call me “Mr. Short” for the rest of the flight including on disembarkation in LA — so at least he gets points for consistency! Alana provided a truly exceptional service throughout the entire flight. My glass was never empty and I never had to use the call bell. 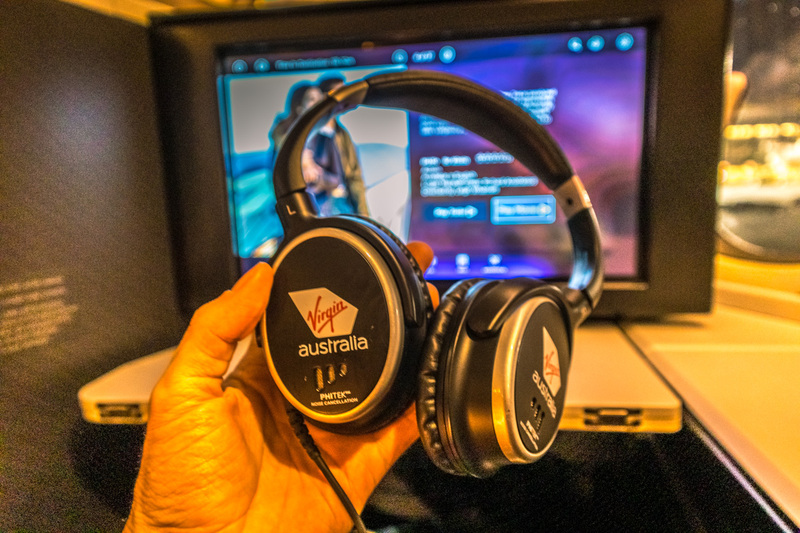 These and other small gestures — such as kneeling down to match my eye level when taking meal orders — made for a truly personal and unmistakably “Virgin Australia” experience. A fixed 18-inch display sits directly ahead of you and can be used gate-to-gate. The system has a relatively limited selection of movies, TV shows, and audiobooks. After recent Sydney-to-Europe return flights earlier in the month I had already seen most of the new release movies that were available — which is obviously not VA’s problem. 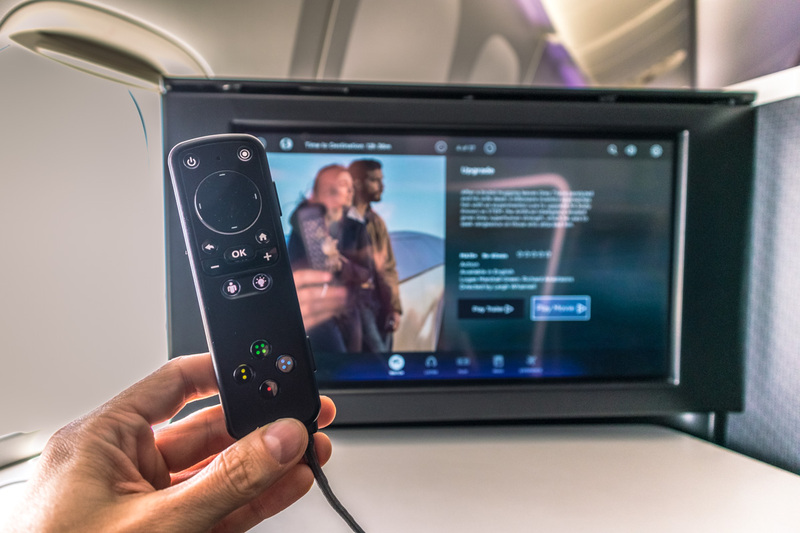 Some noticeable omissions are TV shows found on most airlines such as Family Guy, American Dad, and Modern Family — my usual choices for just before landing when a movie is too long. I also had issues with 2 movies that just wouldn’t play on my screen; I chose other options after a system reset didn’t fix the problem. 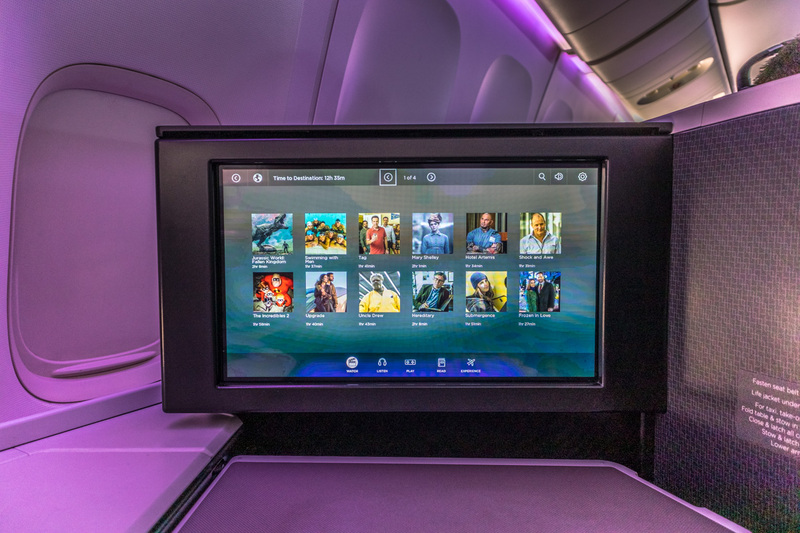 You can control the IFE using either the touch screen or the in-storage retractable IFE remote (which doesn’t have a touchscreen like I’ve seen on other carriers). 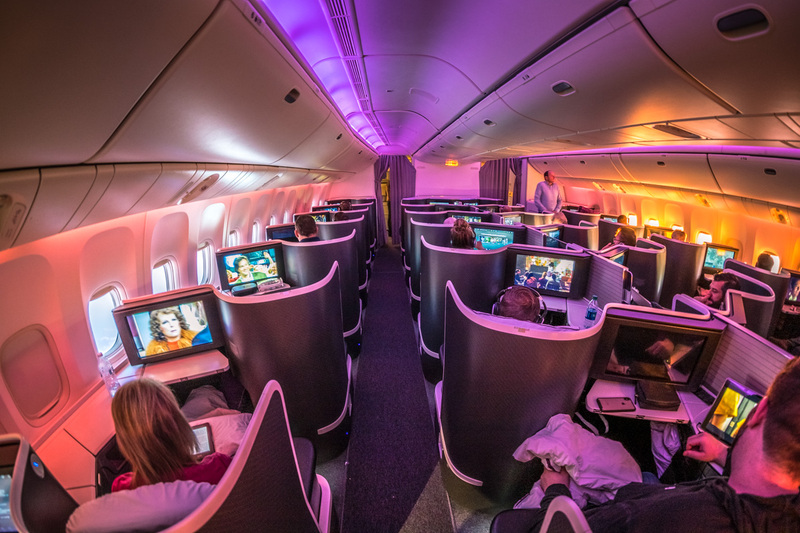 Virgin Australia only recently completed the installation of Wi-Fi across its 777 fleet. Plans start from AUD $8.99 for 1 hour, but I opted for the $19.99 full-flight plan, which was the best value for my 13-hour journey. There is a period around 3/4 of the outbound journey that has no coverage, which is fine since you should be sleeping during that phase anyway. 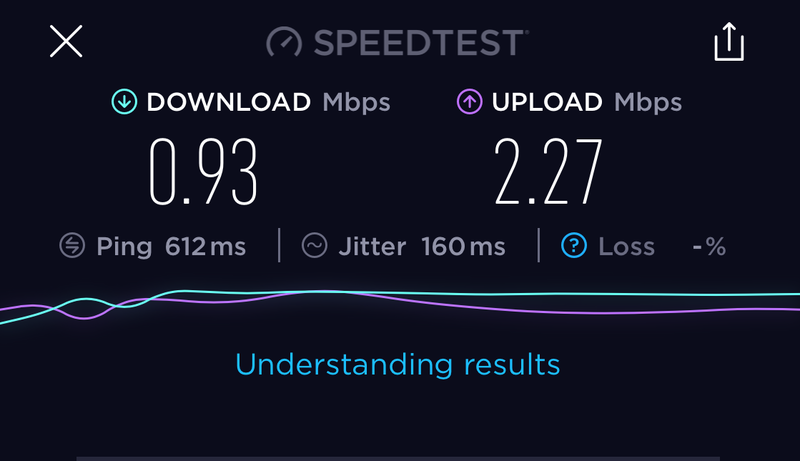 Downloads averaged 0.93Mbps and uploads 2.27Mbps — it won’t win any speed races, but was fine for checking emails and messaging. The IFE has a map, but it’s not a 3D moving version like you’d see elsewhere. 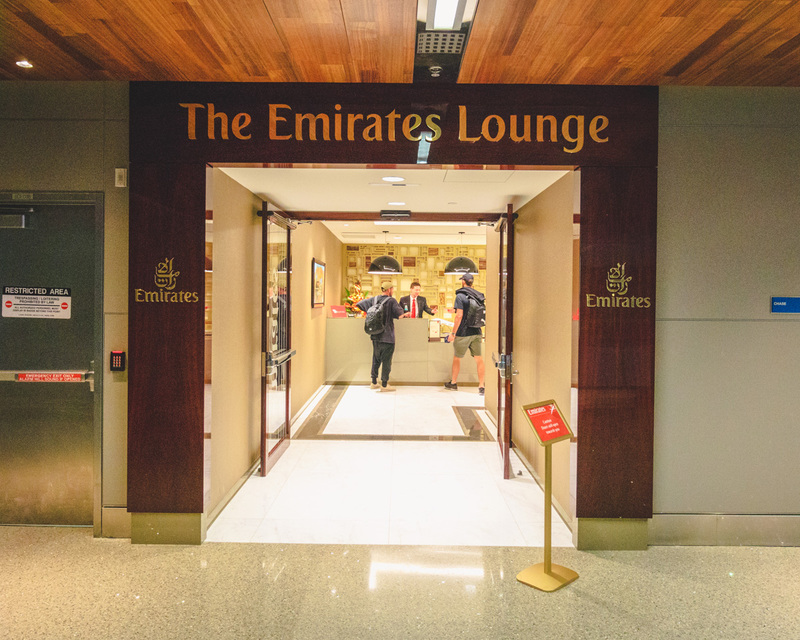 Before departing Los Angeles, guests traveling in “the business” can use the Emirates lounge at the Tom Bradley International terminal. 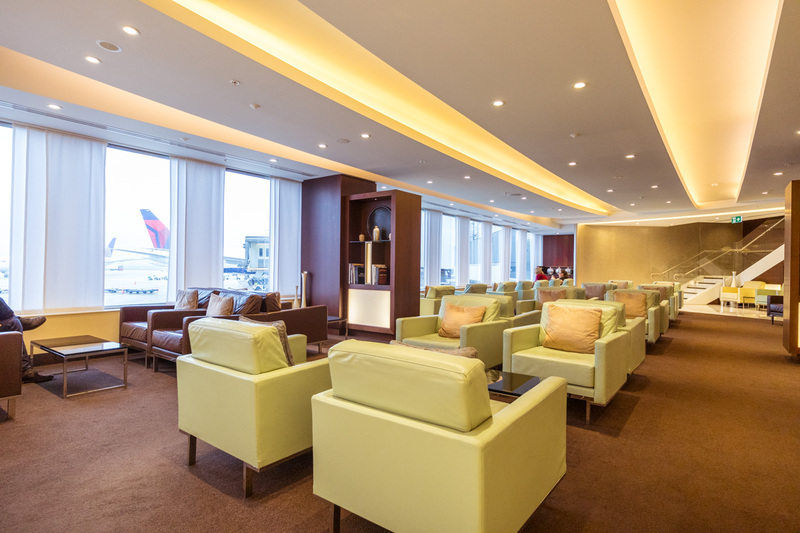 The lounge has extensive seating in the familiar Emirates beige color scheme. There is additional seating on the balcony overlooking the enormous TBI terminal. 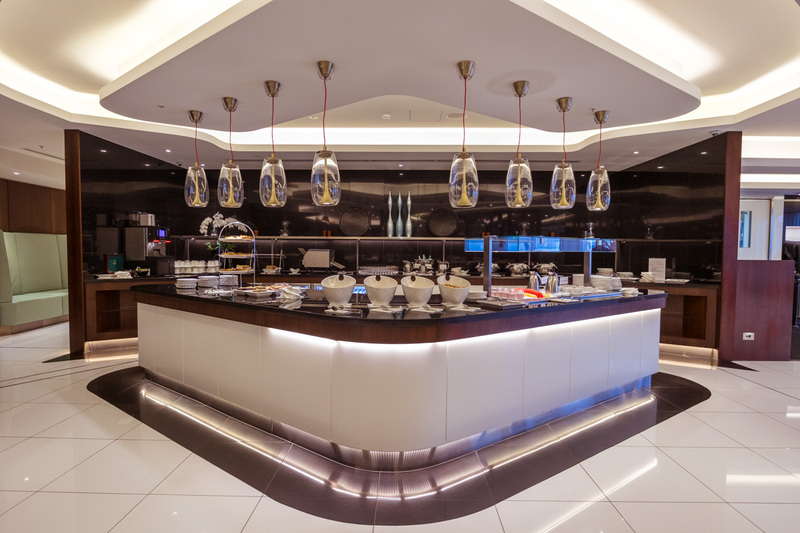 An extensive selection of both hot and cold food options are available from the buffet, as well as a wide selection of self-serve alcoholic beverages. I decided to switch things up on the return flight and sit on the K-side of the aircraft in seat 4K. Although noise-canceling headphones are provided, they are no match for a BYO-branded headset like my Bose. 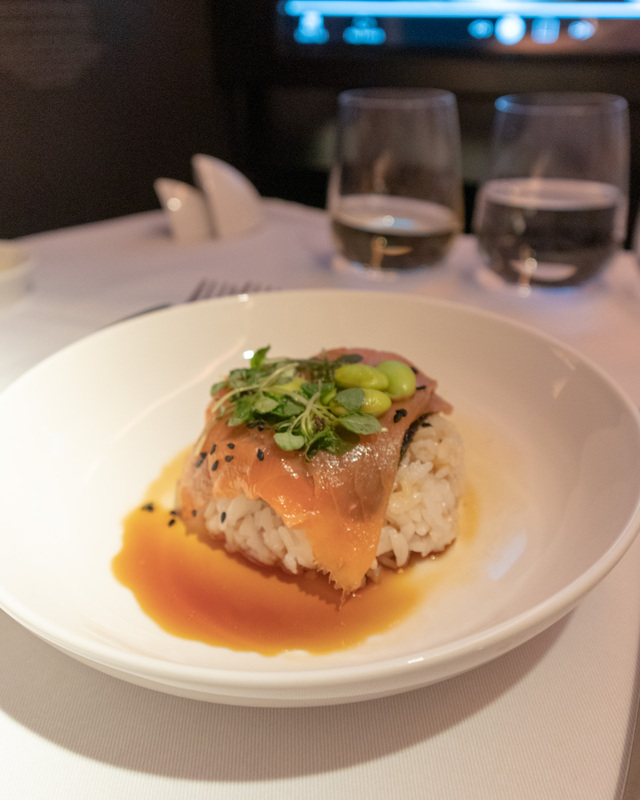 For starter, I selected the smoked salmon with short-grain rice, avocado, edamame, sesame, and ponzu. 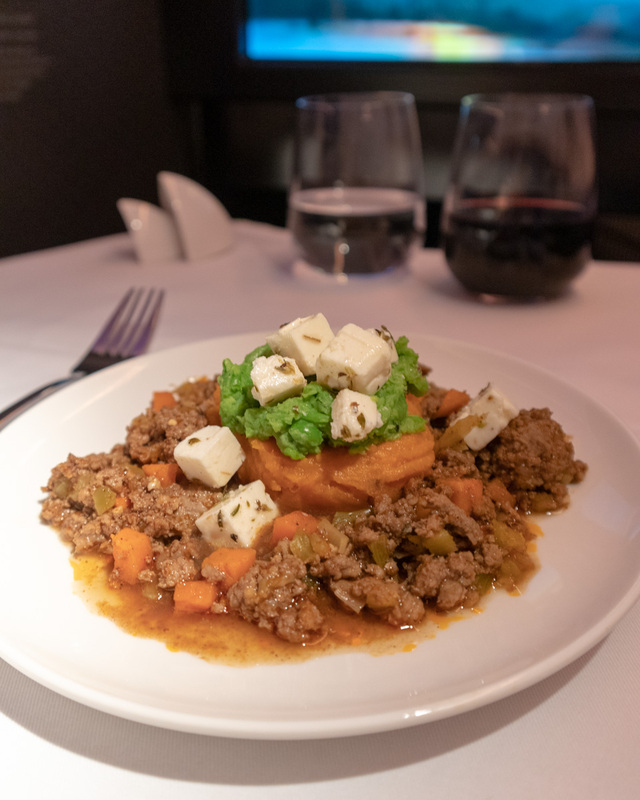 And for the main I chose the barbeque-spiced lamb shepherd’s pie with sweet potato, peas, and marinated feta. 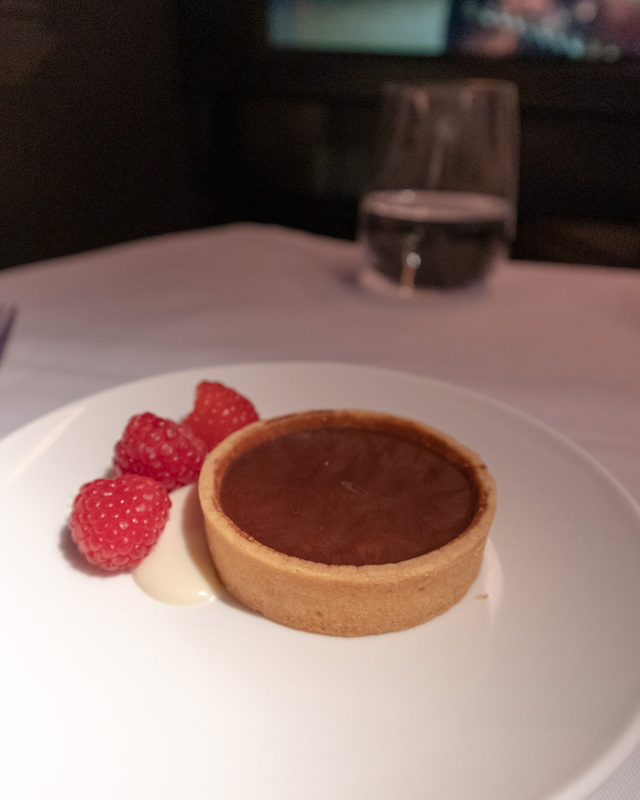 The main meal service wrapped up with a chocolate and caramel tart with raspberries and crème anglaise. 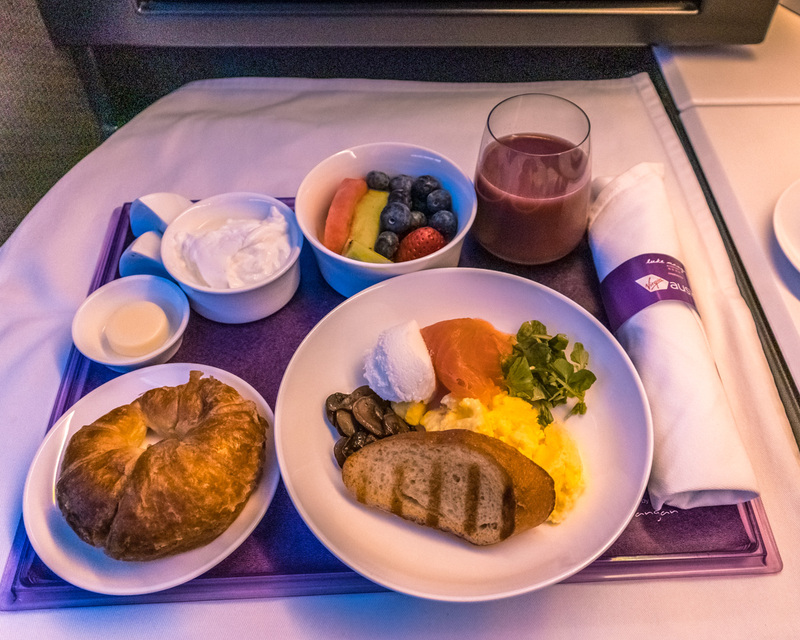 Breakfast was served 2 hours before arriving into Brisbane, and I opted for the scrambled eggs with a side of sourdough toast, smoked salmon, ricotta, sautéed mushrooms, croissant, fresh fruit, natural yogurt, and a smoothie with berries, banana, and apple. 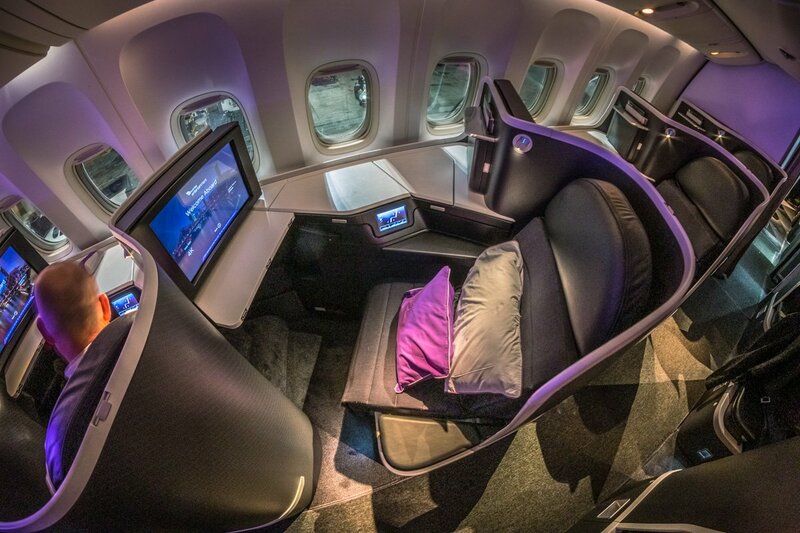 Virgin Australia’s “The Business” is one of my personal favorite business class products. 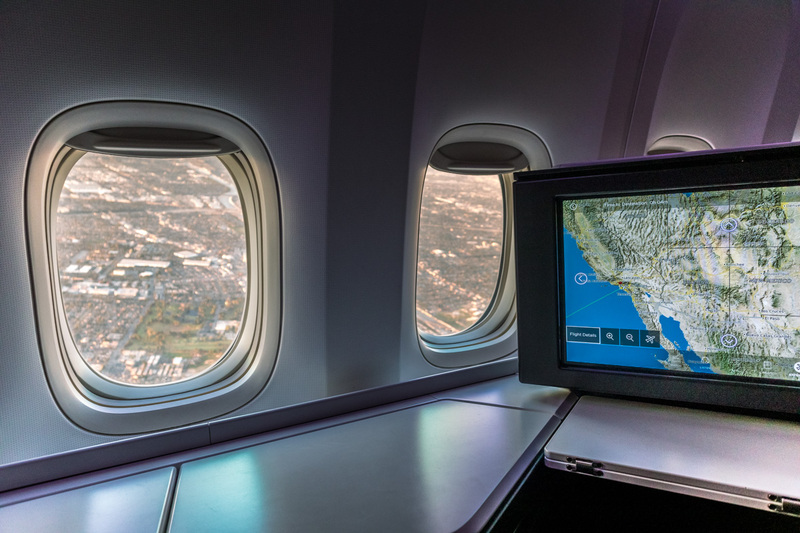 Although there are some obvious cost savings compared to other products using the same seat (no lumbar adjustment, no touchscreen remote, smaller IFE selection, no moving 3D map), these in no way detracted from my onboard experience. 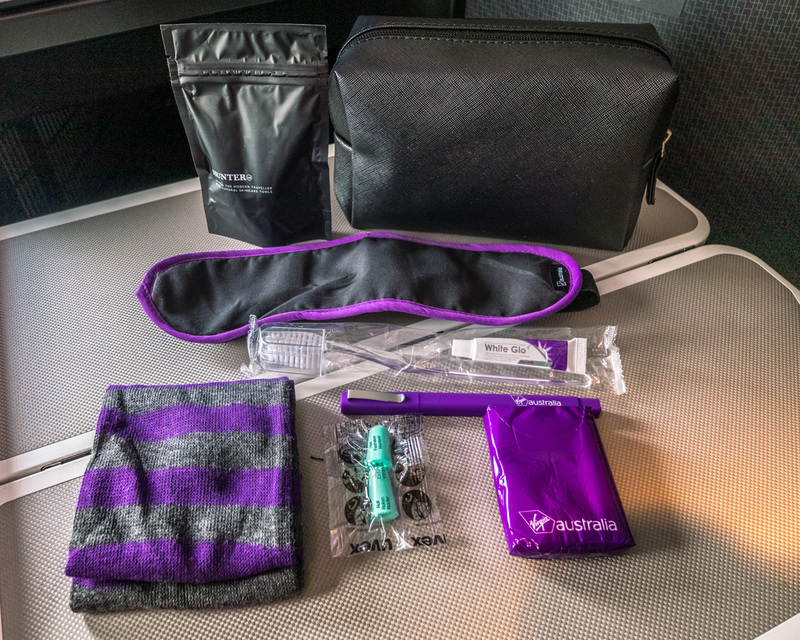 I’ve been fortunate to experience this product several times on the AU-US route, and even the SYD-PER transcontinental route on their Airbus A330 with the same product. The consistency of this product continues to amaze and delight me — from the genuinely friendly crew to the delicious Luke Mangan meals. 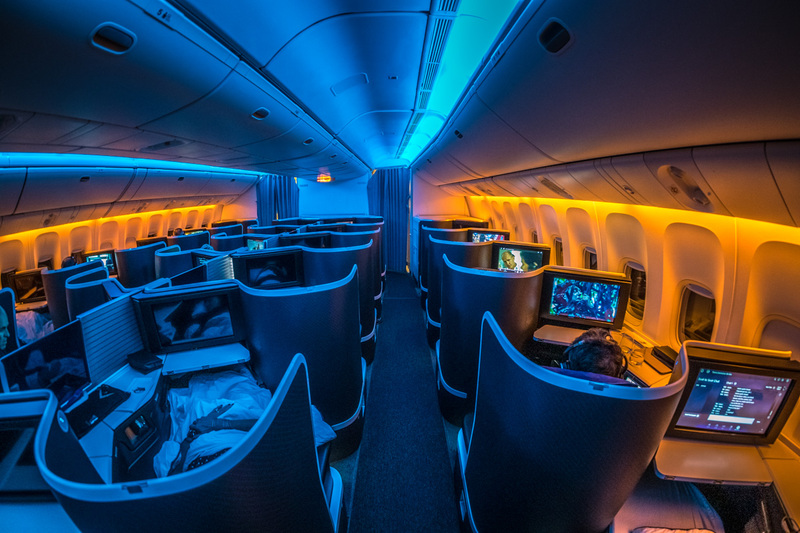 Add to this the comfortable seat with direct aisle access for all passengers, a cozy bed for sleep, the phenomenal bar to stretch your legs, and the Nespresso coffee — “The Business” is by far the best business class product crossing the Pacific. 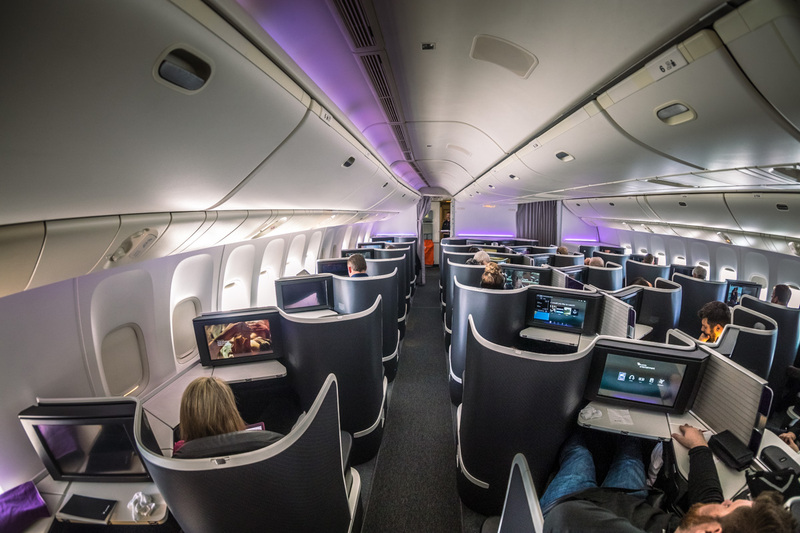 It will be very interesting to see how this compares to the new Delta One Suites (which will start flying the Sydney return in April 2019) and the refurbished Qantas A380s that start rolling out in March 2019.